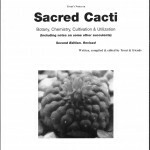 This article, & the book Sacred Cacti, is best viewed at http://sacredcacti.com/blog/lophophora-williamsii-analysis/ My apologies for any 404 pages that may exist as the transfer is completed. 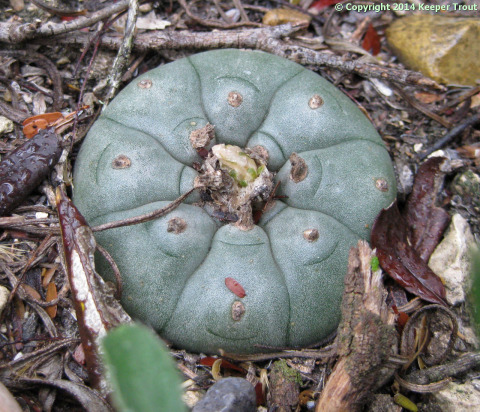 As is true for the alkaloid level of any plant, the mescaline content of peyote exists as a range that is influenced by at least several factors. The following simply summarizes the literature. Only some type of actual analysis or bioassay can say something accurate concerning a plant in front of a viewer. Literature should be viewed with caution and regarded to be only guidelines suggesting potential values. Heffter reported a maximum recovery in his work of 6.3% mescaline, 5.3% anhalonidine, 3% anhalonine, 0.5% lophophorine, 5.3% anhalamine. 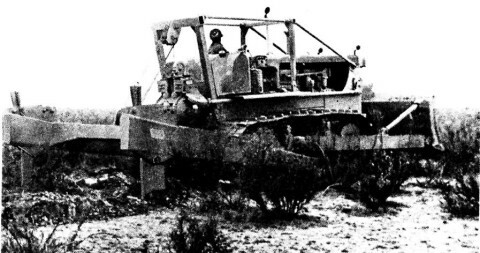 Späth later reported having much lower yields working with old material. 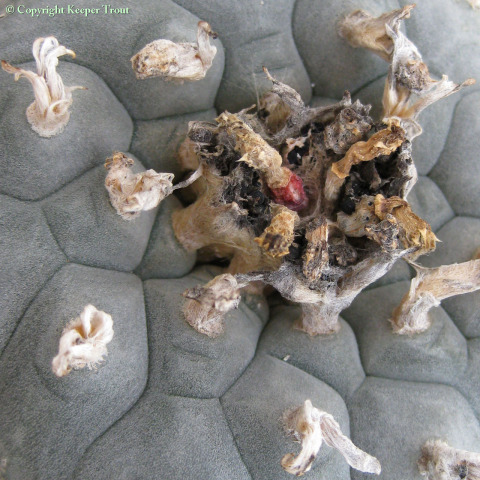 Crosby & McLaughlin 1973 commented that mescaline content in dried peyote can reach 6% but rarely exceeds 1% in dried whole plant. 6% appears in Anderson, Kapadia & Fayez, Lundström 1971b, Martin & Alexander 1968, and Reti 1950. These are all second-hand accounts of that 6% value; referring to its publication by Heffter. 0.1% dry wt is the lowest value in the literature; reported in Siniscalco Gigliano 1983. 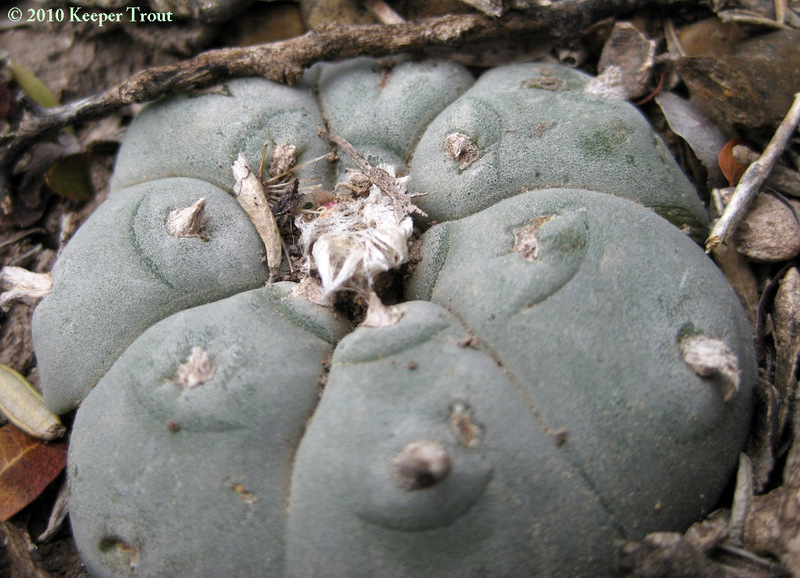 Ott 1993 estimated 2.4-2.7% mescaline by dry weight (~400 mg. per 16 grams of dried cactus) citing Bruhn & Holmstedt 1974 and Lundström 1971b. Friends with extraction experience found fresh plants to average 0.2% mescaline from fresh plants and 1-2% from dried material. 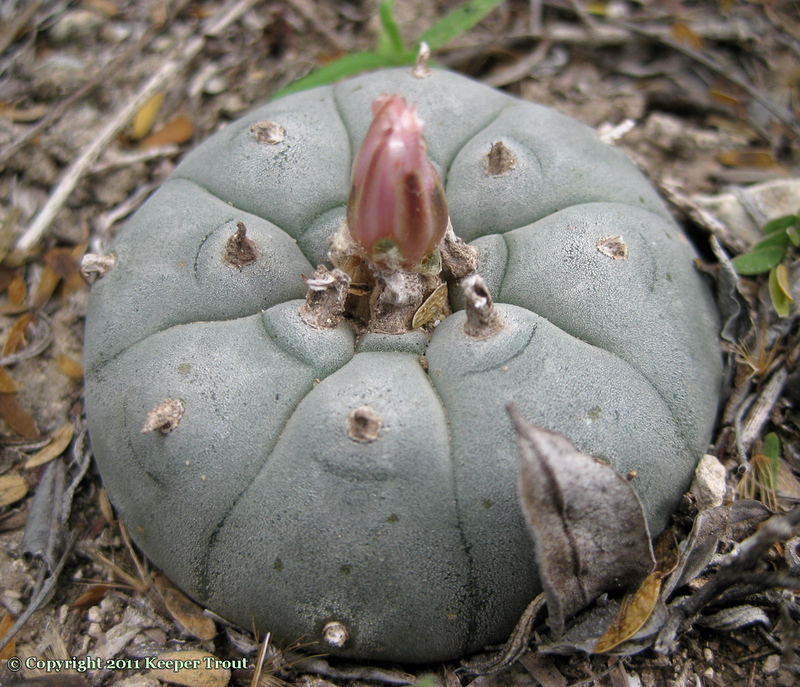 This refers to peyote originating from South Texas during the mid-1970s. This work was always done under fairly primitive and inefficient conditions. 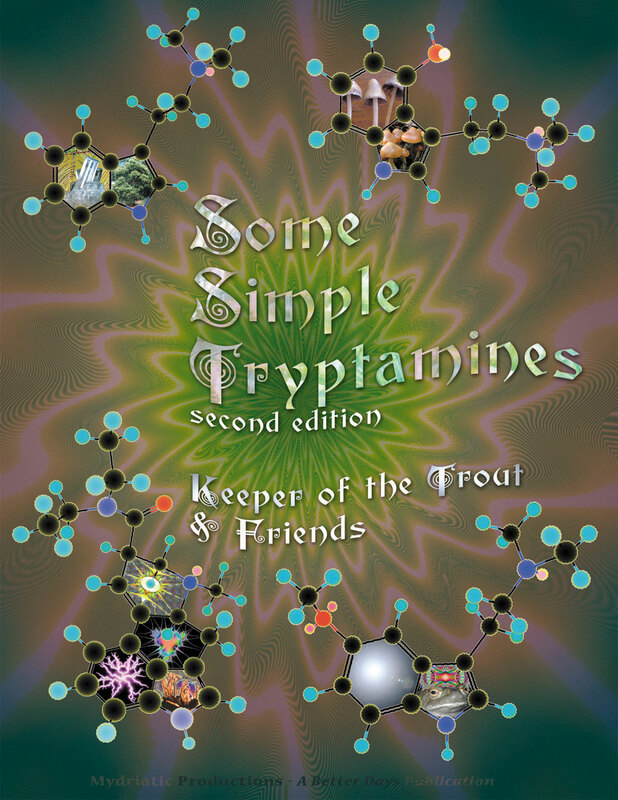 2% is usually cited as an estimate in counterculture drug manufacturing literature. 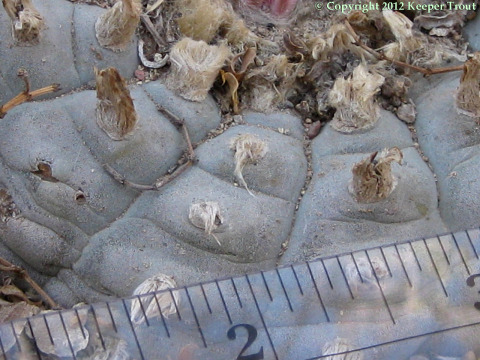 (50 grams of dried peyote per gram of mescaline recovered.). Recently, a meme of “1% max” has been circulating; perhaps reflecting the current decrease in the average age and size of harvested plants due to careless overharvesting and harvest practices? Mescaline has been reported to comprise around 30% of the total alkaloid content of L. williamsii: Lundström 1971b. (Averaged % by dry weight: – Used batched samples. 2.01% small regrowth crowns (4 year after the prior harvest). Kalam et al. 2012 & 2013. Batched samples were used to deliberately create an average value and lessen the possible contribution from potential high or low outliers. Comparison of Hulsey with Klein’s paper shows the wisdom in choosing that approach even if it does deprive us of an understanding of the max/min values. 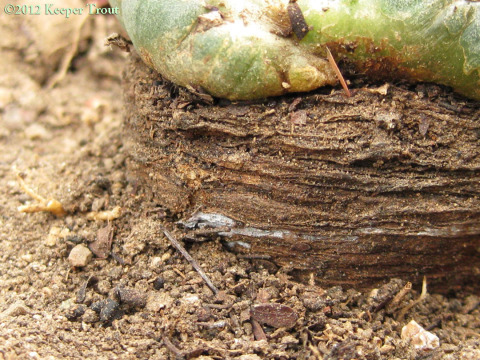 The ideal approach is a screening using batched plants followed by a more detailed look at a set of the individuals. 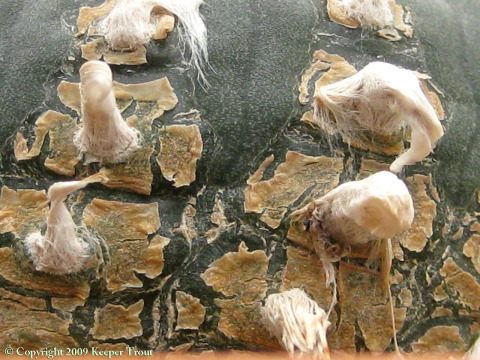 One peer reviewer suggested that batching in Kalam invalidated their results, which if true would invalidate the results of almost all published analytical work appearing in the history of phytochemistry. Almost all workers analyze multiple individuals to minimize the influence of potential outliers, the only actual difference between the acceptable approach of those workers (including in the same journal) and what was complained about with Hulsey or Kalam is the earlier workers did not REFER to their batched samples as being a batched sample. 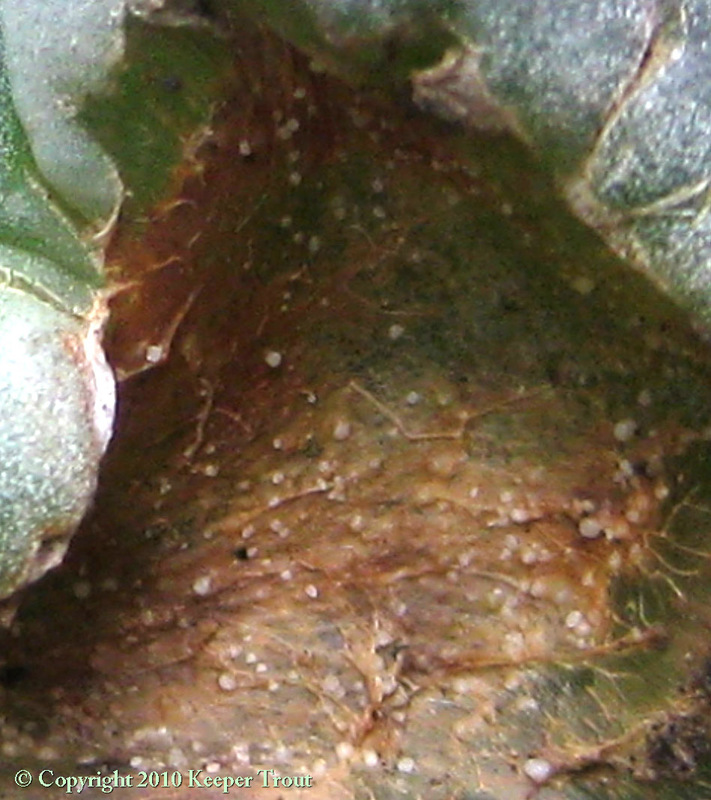 Janot claimed to have established that mescaline was largely produced in the peripheral green parenchyma of the crown. 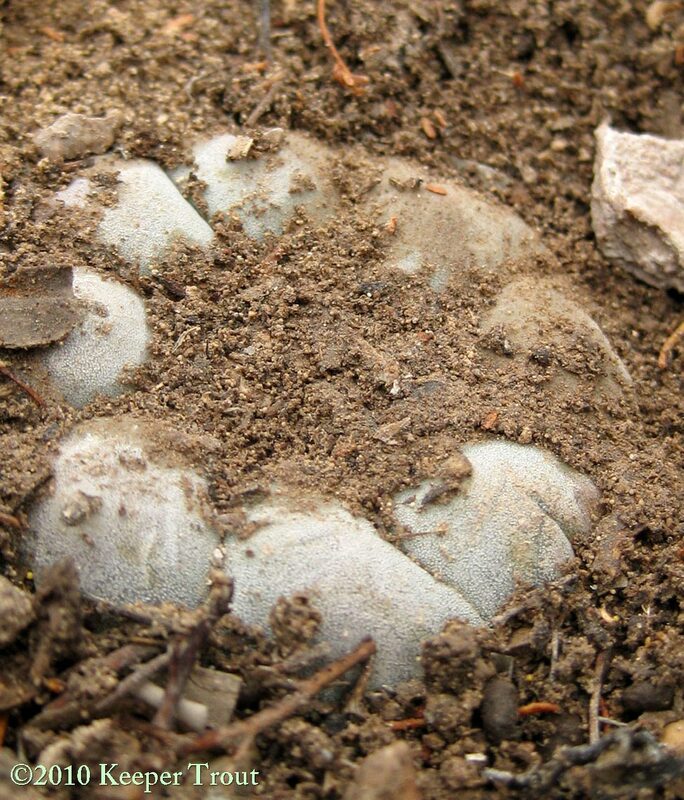 As this was during the 1930s the identification would have been established using microchemical methods. Klein et al. 2013 & 2015. Notice that there is an order of magnitude decrease from crown to stem and again from stem to root? up to 2.74% dry weight after 6 months of dry conditions. All from peyote plants being cultivated in Italy. 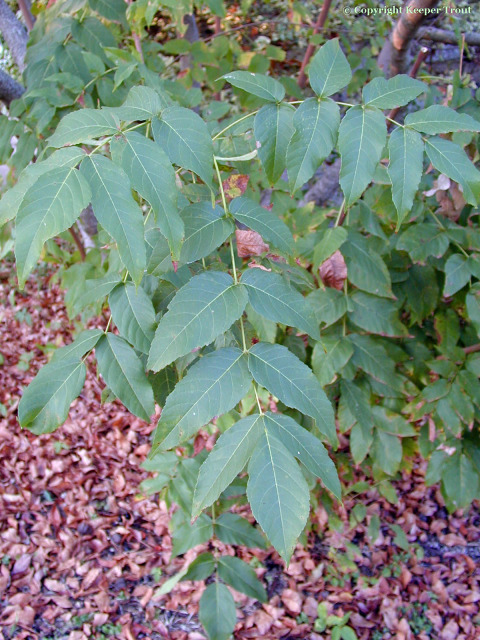 Dried plant is said to have 3% Roland Fischer but Fischer claimed that only if chewed well or ground finely can this be extracted. He presented a study as indicating that less than one percent is obtained by chewing and swallowing. 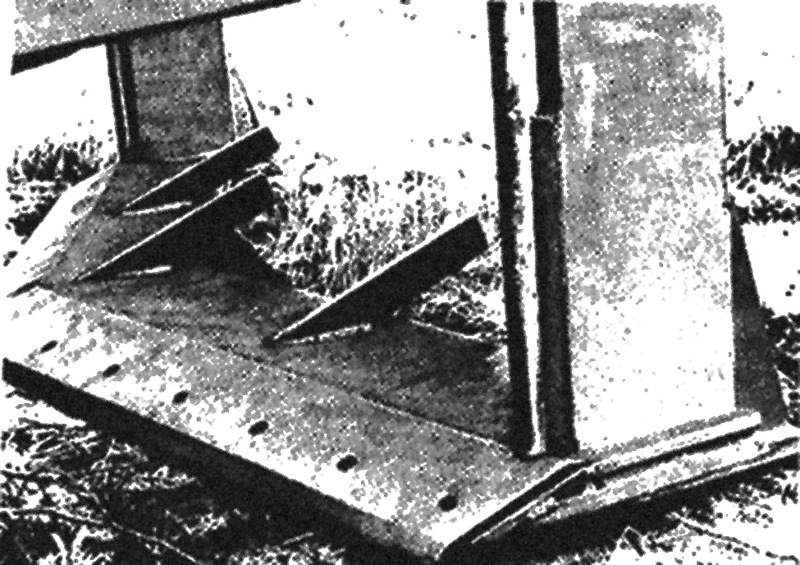 While finely grinding or chewing well is important for obtaining the best possible absorption (especially if using dry material) it must be pointed out that Fischer’s reasoning had some problems. 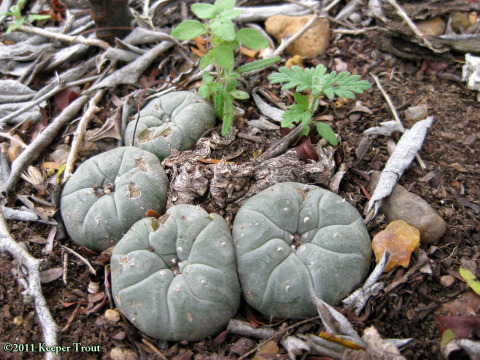 Fischer was able to get 3% mescaline from dried peyote by grinding it to a powder before beginning his extraction procedure. He found that if this dry grinding was omitted and the buttons rehydrated by soaking in water for two hours and then ground before extraction he could only recover 1%. 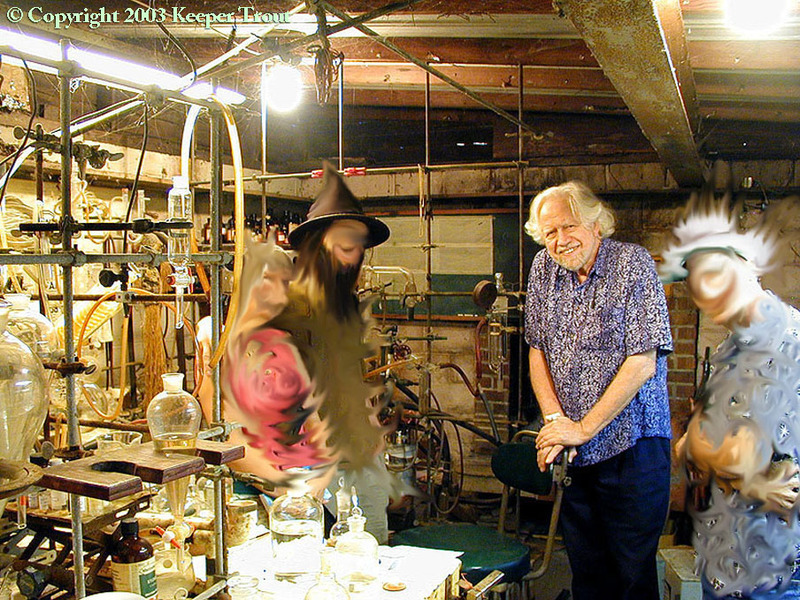 He went on to conclude “The only safe conclusion would be that the chewing of peyote and the swallowing as a bolus are certainly less thorough extraction procedures than our “wet grinding” procedure which recovers only about 1% of mescaline.”There several major flaws in Fischer’s reasoning and procedure, in so far as applying it comparatively to humans. The more trivial of the two concerns Fischer basifying the buttons after soaking in water and then grinding, filtering, washing and adjusting the pH to 3.4 to 4. Although in agreement with the idea that chewing well or fine grinding is important to the best absorption, any direct comparisons of his findings to human rates of internal utilization need questioning. 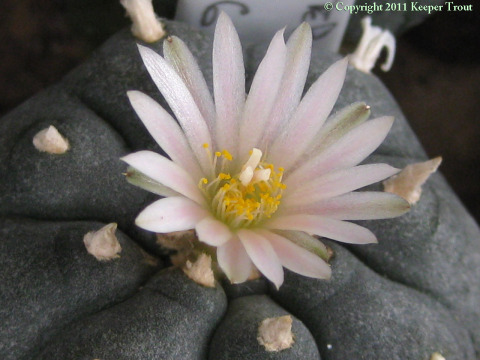 While direct measurements of internal absorbence may not be possible, it would be feasible to administer known dosages of mescaline and subjectively compare them with known amounts of mescaline in cactus material. If a series of such bioassays were performed using experienced users a rough estimation could be determined which would be at least as accurate as Fisher’s extrapolation. It may also be possible to determine the percent of absorbence by monitoring the initial rise in blood levels during the early stages. This also would require the use of pure mescaline to establish a baseline. It also would require repeated evaluations using both different and the same individuals to be certain that biochemical individuality did not affect the results. Sasaki et al 2009 and Aragane et al. 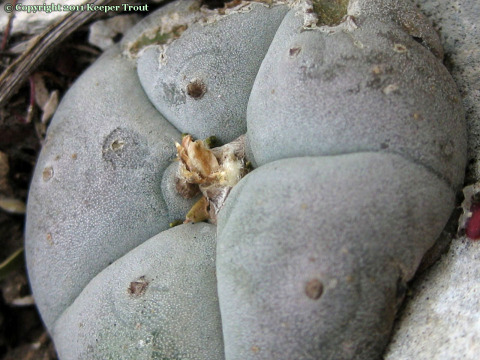 2011 published details from an interesting study of Lophophora demonstrating that genetic and chemical differences exist between L. williamsii and L. diffusa. 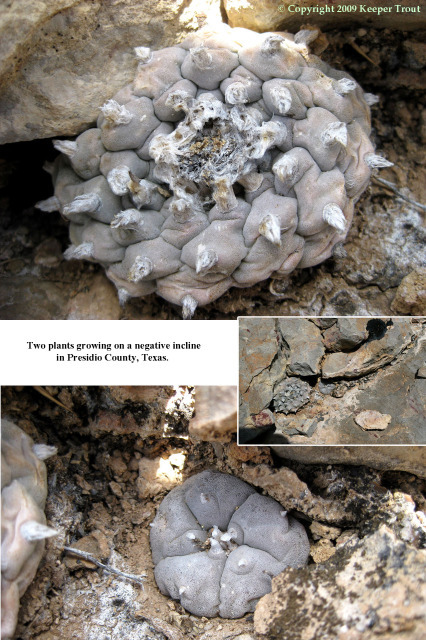 They additionally included three specimens of L. fricii but apparently renamed it based on what they found in publications by Edward Anderson, by Yoshio Ito & by H. Hirao. Aragane presented it to be a nonmescaline variant of L. williamsii. 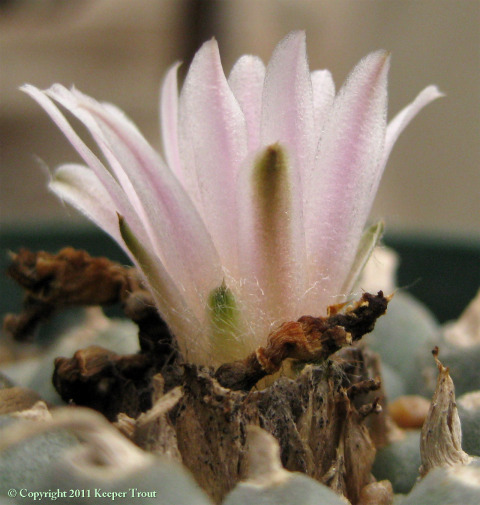 Earlier, Sasaki had said they had reidentified it as L. williamsii var. 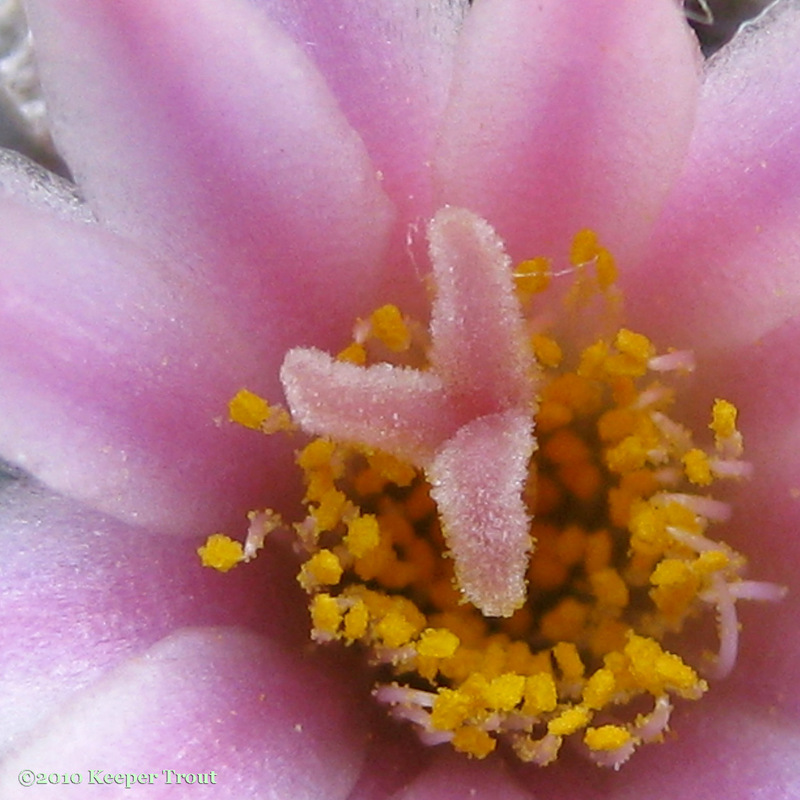 decipiens. It is clear without any doubt that those three specimens were Lophophora fricii. 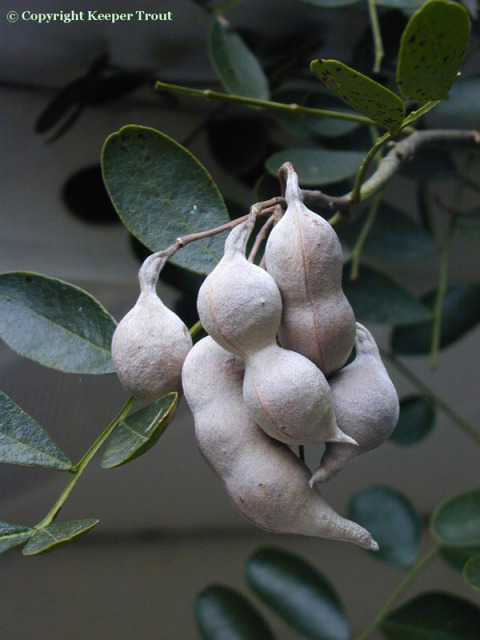 5) They were purchased identified as Ginkangyoku (which is the Japanese trade name for L. fricii). 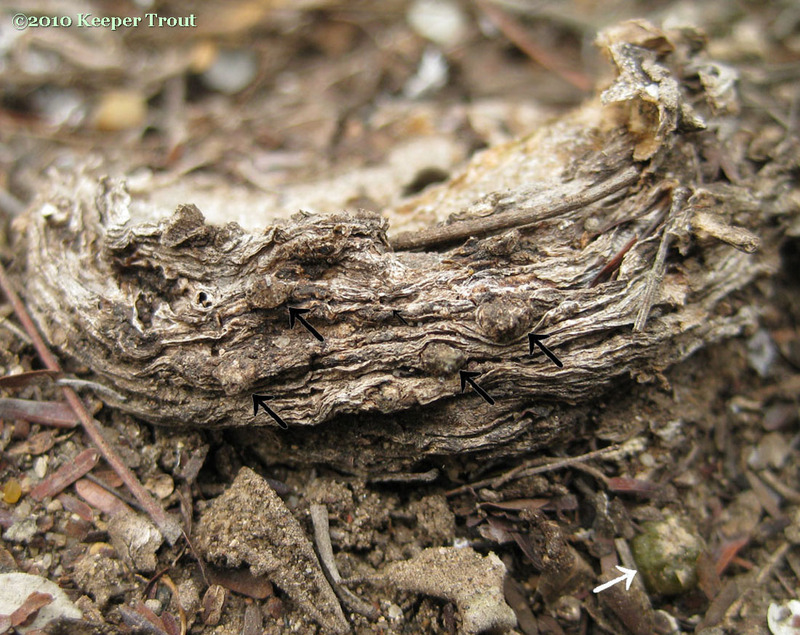 “We identified the materials according to Anderson’s morphological classification.” Sasaki et al 2009. The pertinent point being that Anderson recognized both Habermann’s Lophophora fricii (and wild plants he had encountered of Lophophora koehresii) to be L. williamsii. His view that only two species exist (L. diffusa and L. williamsii) is the basis for Aragane & Sasaki’s name assignment. 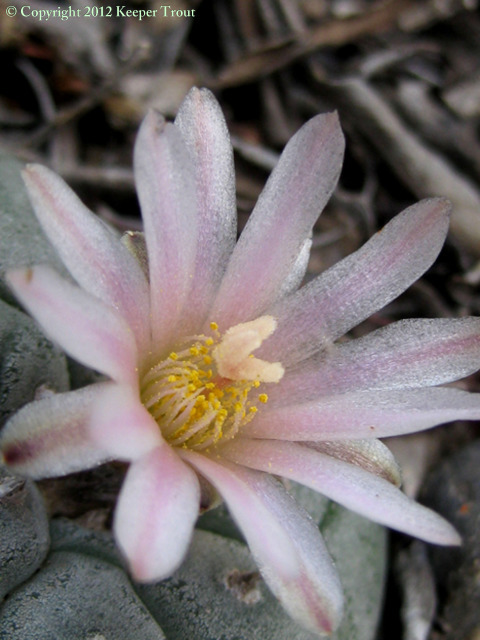 “Although the presence or absence of mescaline can easily be checked by chromatography, it is difficult to identify the species because not all L. williamsii contain mescaline. 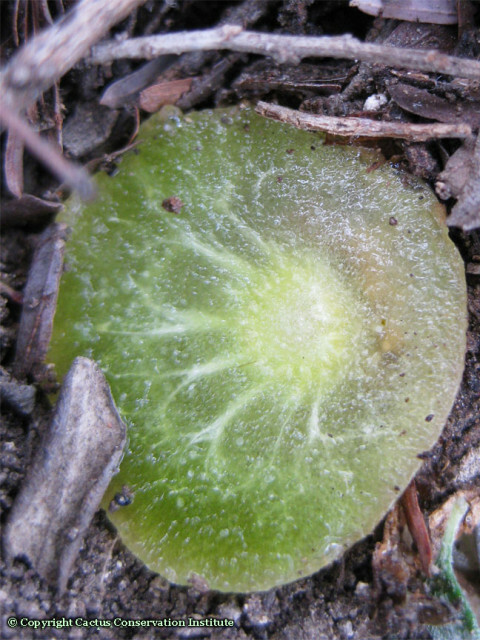 Chemotaxonomic identification of L. williamsii seems insufficient. 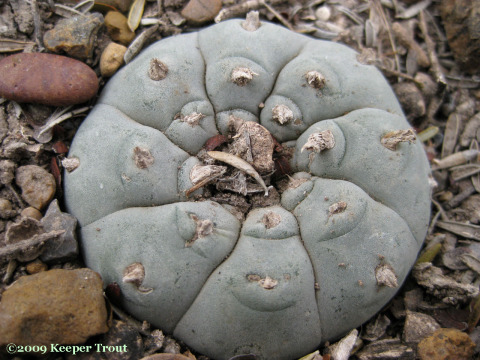 DNA sequences of chloroplast trnL intron region in Lophophora plants were revealed to be beneficial for identification and showed a good correlation with mescaline content.” Sasaki et al. 2009. 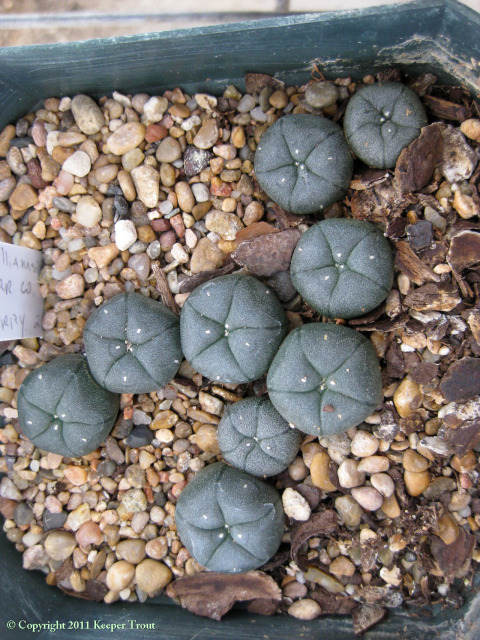 It is fascinating that they did not grasp that they had just produced might could be considered to be adequate proof that L. fricii merited recognition as a species separate from L. williamsii rather than being considered to be a nonmescaline form of L. williamsii. Aragane et al. 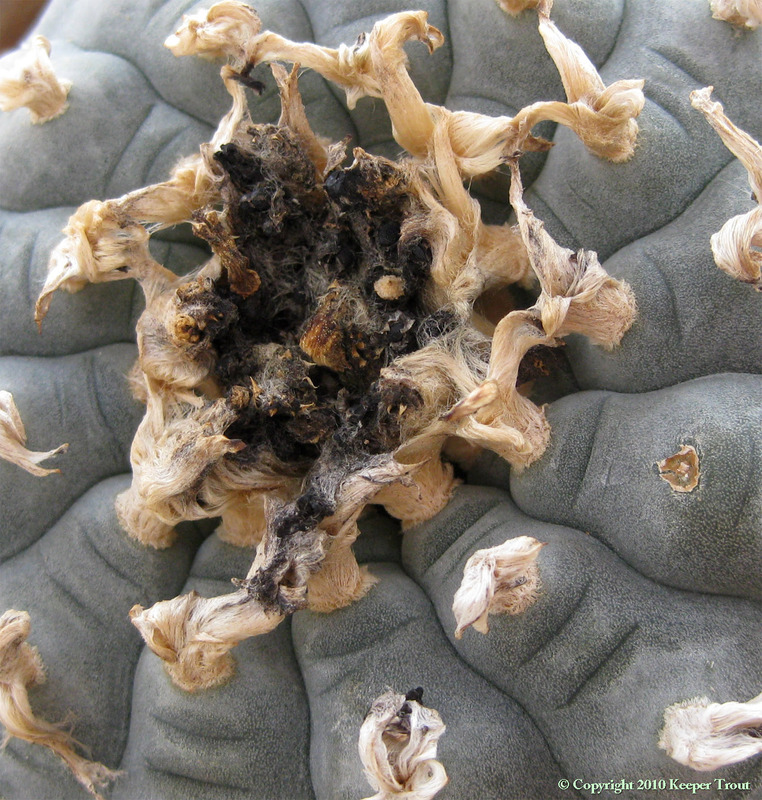 2011 reported mescaline concentrations in their Japanese horticultural specimens to range from 1.27-4.83%. (The concentrations reported for those 13 averages to 3.2%.) This is a range AND an average value that is quite comparable to what has been reported from wild plants. Their presented sources produced some questions. In Sasaki et al. 2009 their plants were said to have been obtained from the “Medicinal Plant Garden, Tokyo Metropolitan Institute of Public Health“. In Aragane et al. 2011, most were listed as having been acquired through the “Internet” with all of the remainder coming from “Market (Mie Pref.)“. 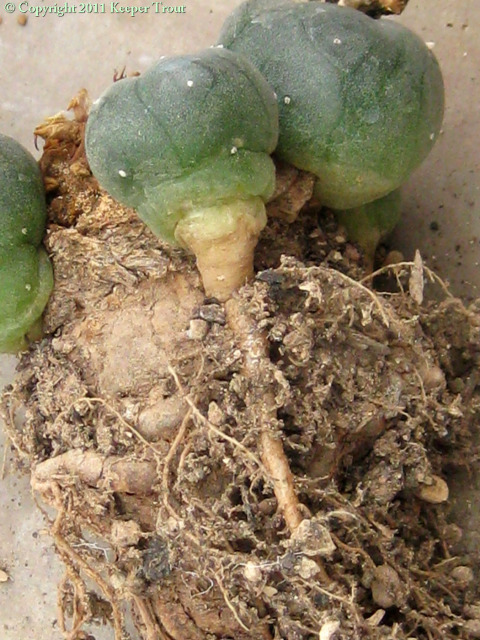 Whether Aragane’s comments on dates and sources referred to the origin for the plants that Sasaki listed as being from the “Medicinal Plant Garden, Tokyo Metropolitan Institute of Public Health” or if Aragane’s comments were intended as a correction to Sasaki is not made clear. 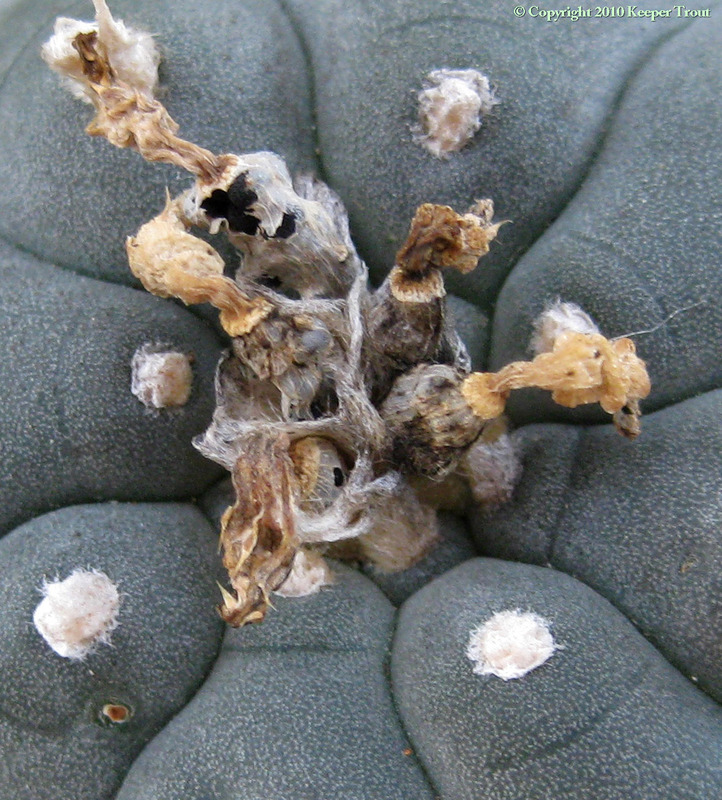 30% is present as mescaline; 17% as pellotine. Schultes & Hofmann 1980: 221. Lewin was the first to isolate an alkaloid from peyote but it turned out to be both inactive entheogenically and a mixture of several alkaloids. Heffter isolated 3 alkaloids from Lophophora williamsii and published his results and pharmacology in 1898. 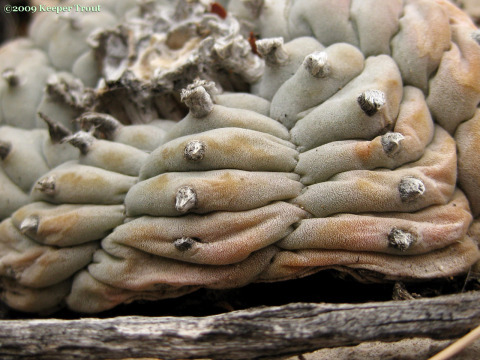 He named the active compound mescaline; determining it to be the active alkaloid by personal bioassays. [Heffter 1898a] Heffter named the other two alkaloids Anhalonidine and Lophophorine. A total of 35 isoquinolines had been reported prior to 1986, according to Menachery et al. 1986. The number of compounds now mentioned in the chemical literature as actually being detected in the plant is 72. Of which some are questionable inclusions, some are clearly errors and a number alkaloids still need a second-party confirmation by someone. At the moment the presence of 63 alkaloids has been established. No doubt new trace alkaloids in peyote will continue to be found in the future so long as people devise more sophisticated techniques and/or continue to look for them. 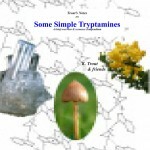 It should be pointed out that any and all recent finds of alkaloids have been in trace quantities. 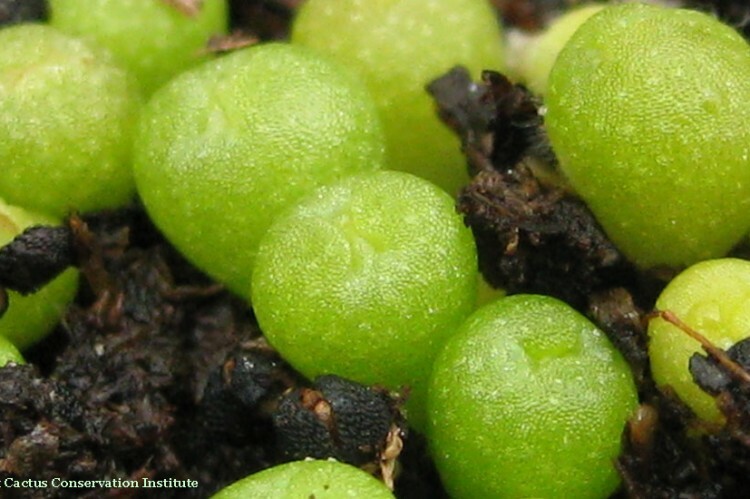 Most have been identified using elaborate ‘trapping’ techniques for identifying short-lived biosynthetic precursors. Which also means it is a bit of a stretch to consider those components in the alkaloid fraction since normal extraction processes will not be able to recover them. Any alkaloids discovered in the future will similarly be of purely biochemical interest rather than pharmacological contributors to the action of peyote. 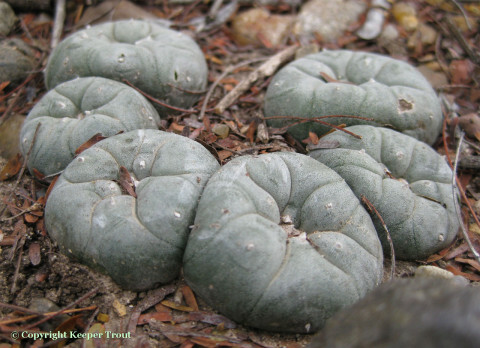 In an incredible move suggested more than a small level of ignorance (and, at best, a serious lack of factual information), in 1997 Congress made law a provision declaring every alkaloid contained in peyote to be a Schedule One controlled substance. 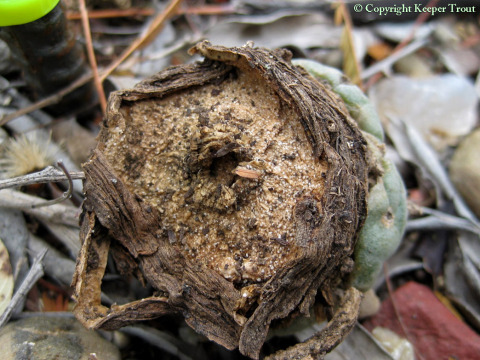 Since several of these are normal components of human body fluids (including blood, CSF and urine) and many are present in a wide variety of plants, what this actually means remains to be seen. 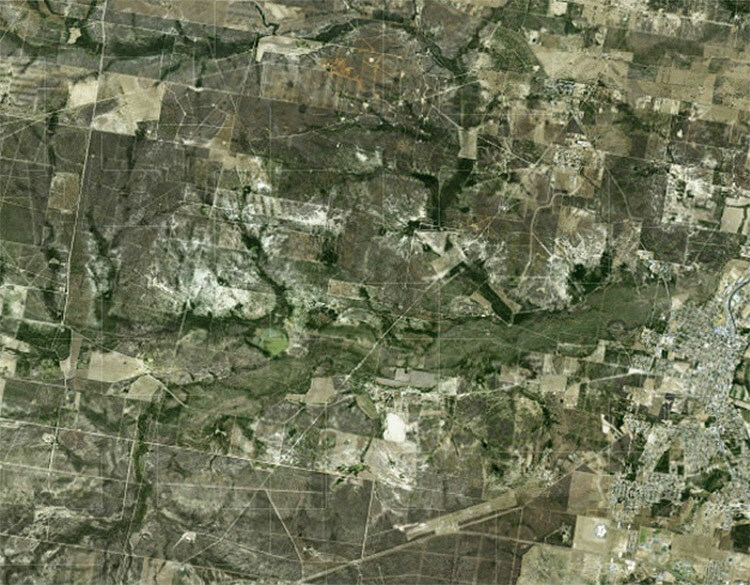 It is more than a bit disconcerting that there are now AT LEAST a handful of normally present endogenous substances that are presently considered Schedule 1 (potentially as many as 9 different compounds); placing every human on the planet in measurable and perennial violation of US federal law. 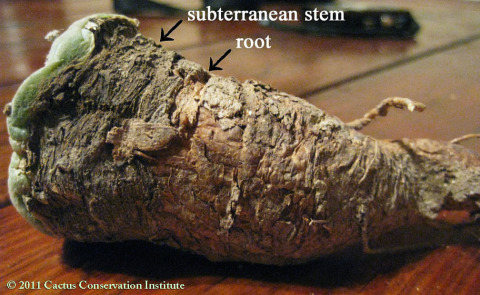 According to Anderson 1980, Todd found little variation in the alkaloid concentration between roots and tops of plants except for hordenine which he found to be present only in the roots. This is misleading as stated. 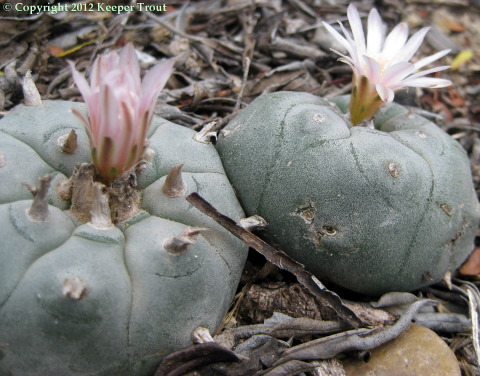 Todd 1969 analyzed two populations of Lophophora williamsii (and also L. diffusa from Querétaro) collected during June, [a time considered to be poor for mescaline and good for isoquinoline effects.] 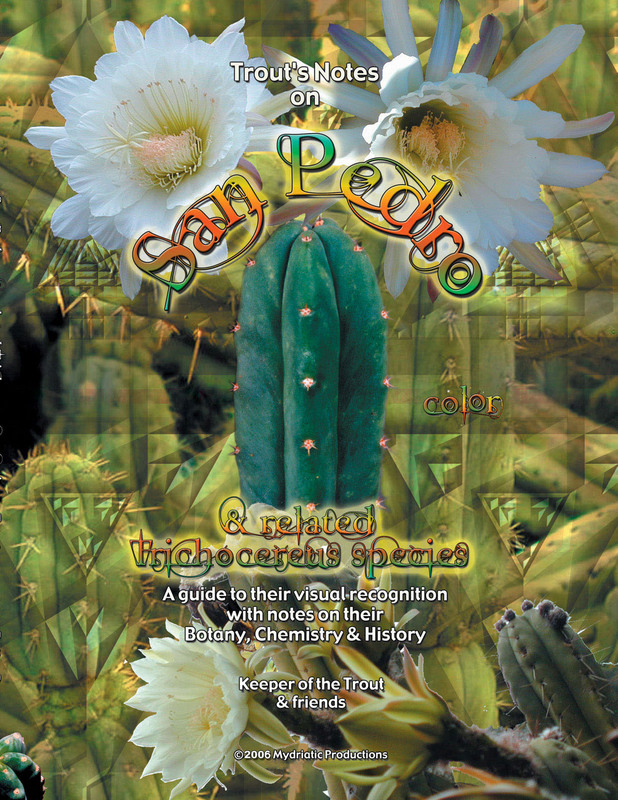 His collections were made by Anderson near Monclova, Coahuila and El Huizache, San Luis Potosí. 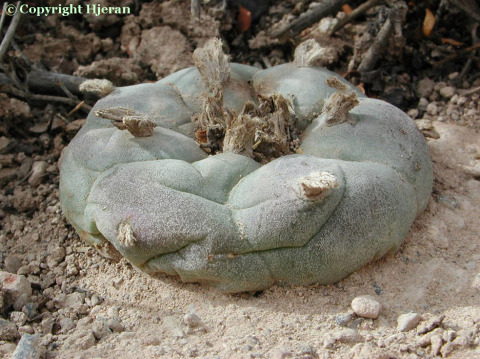 Anhalamine and anhalonidine were present at nearly the same concentration as mescaline in plants collected in Coahuila and at the same concentration as mescaline in plants collected from San Luis Potosí. 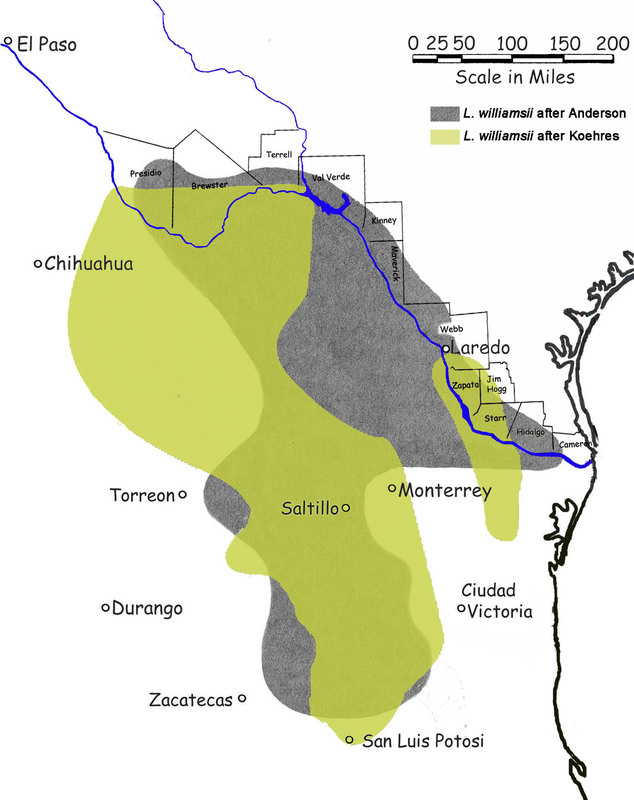 Anhalonine and anhalinine were present at about half the concentration of mescaline in both populations. While pellotine in the tops was present at lower concentrations than mescaline in the Coahuilan population, it was present at roughly equal concentrations to mescaline in the San Luis Potosí population. 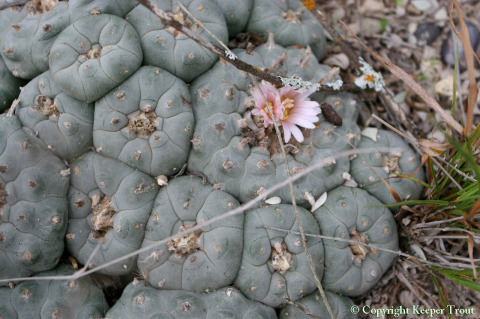 Mescaline concentrations were found to be substantially higher in the population collected from Coahuila. The difference in mescaline concentration between the roots and tops was found to be far greater in plants from San Luis Potosí than Coahuila. 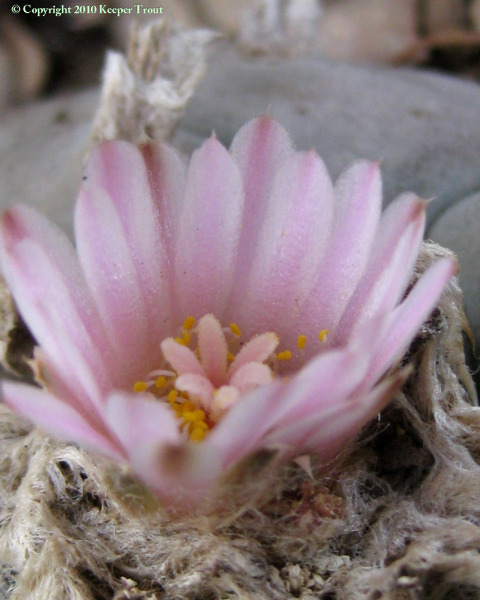 The mescaline concentration in the roots of Coahuilan plants was equal to the concentration of mescaline in the tops of the San Luis Potosí originating plants. Only traces of mescaline were observed in the roots of the San Luis Potosí originating plants (the Texas ‘Peyote Gardens’ population is believed to be similar). 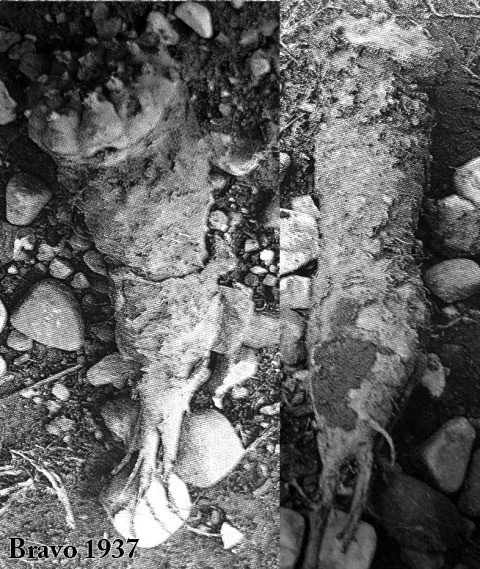 Pellotine was found to be equally distributed between roots and tops in both populations but was present in higher amounts in the San Luis Potosí population. Anhalamine, anhalonidine, and anhalonine were found to be equally distributed between roots and tops and were present in similar concentration in both populations. Anhalinine and lophophorine were found to be equally distributed between tops and roots in the population at San Luis Potosí and less concentrated in the roots of those from Coahuila. 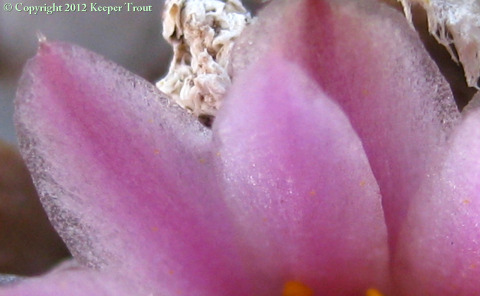 Concentration in the tops of both populations were the same. 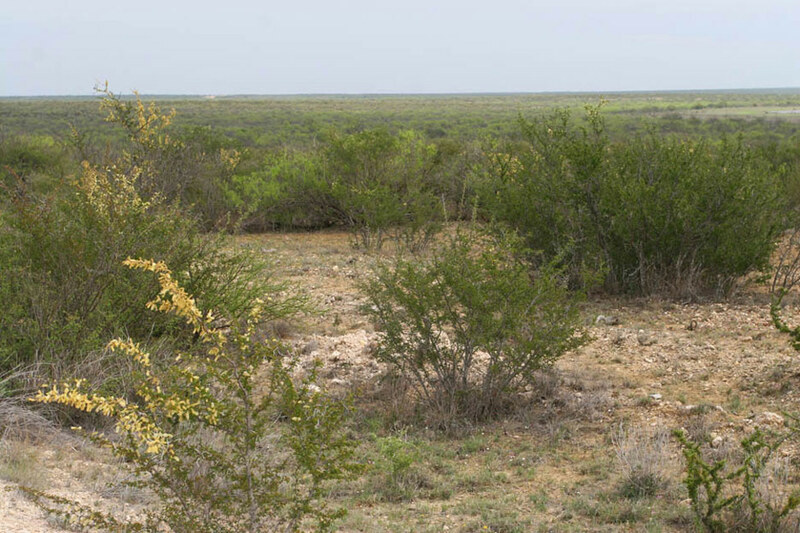 The Coahuilan population is considered to be a stronger variety or even a separate species by some. Chemically there may be justification for this [Note 21] and it should be targeted for propagation. Plants originating from the Texas “peyote gardens” are believed to be similar to the San Luis Potosí population. Todd’s descriptions do not allow comparison with the published descriptive differences between var. williamsii and var. 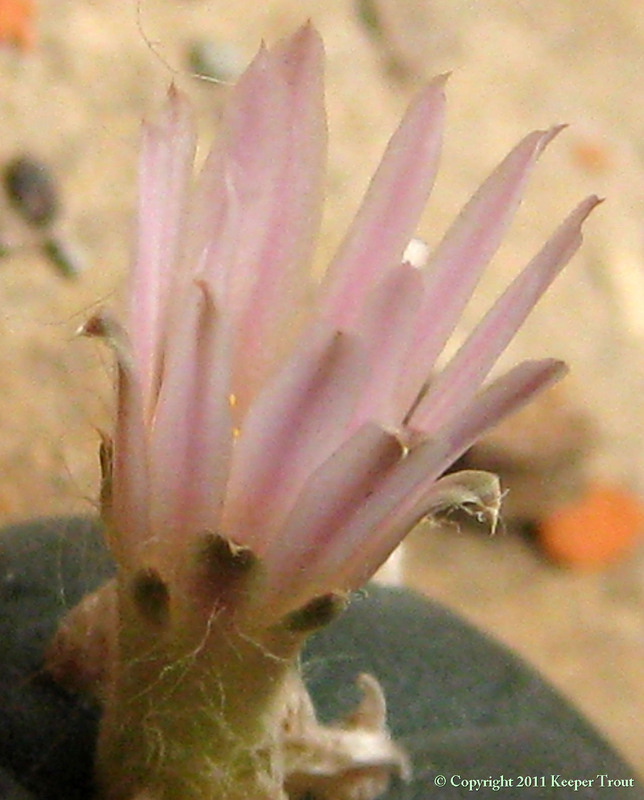 echinata. Lundström 1971b reported that the N-methylated alkaloids (such as Lophophorine) were highest during summer in greenhouse maintained plants. 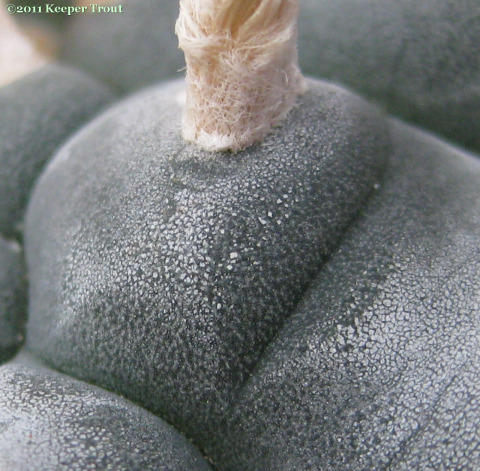 N-Demethylated compounds were found to be higher in fall and winter than N-methylated derivatives. 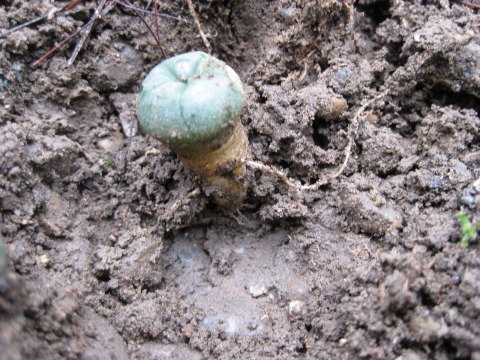 This corresponds well to Peyote using peoples traditionally gathering plants from November through April or mid-May (actual period of harvest varying from group to group but largly falling within this time frame with thre being at least one group of Huichols harvesting in October) and also with subjective observations that December through early March are the times for the best psychological effects and the least somatic distress. I believe that January and February are the most ideal months of the year. 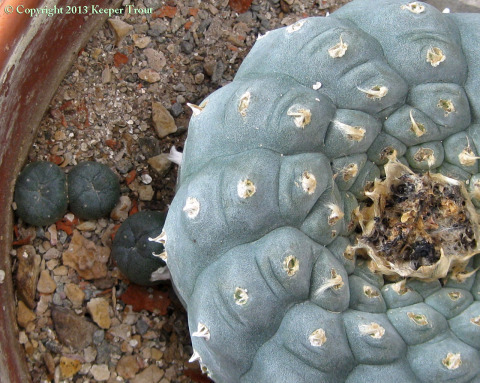 Siniscalco 1983 reported that keeping cultivated peyote plants under arid conditions for 6 months substantially increased their mescaline content. Their corresponding reported values differed as 0.1% compared to 2.74% by dry wt. That is a 27.4X difference which is highly significant as taking a plant from fresh to total dryness only increases the concentration ~10X. Plants were harvested in ?? (they mentioned that L. diffusa was harvested in June). 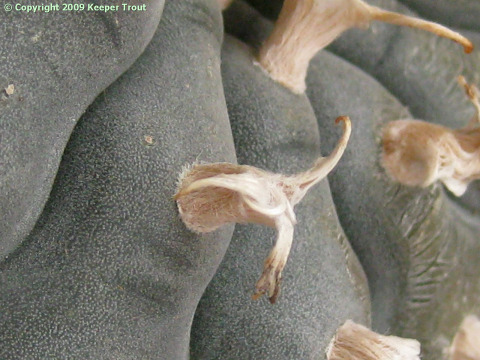 Dried peyote buttons, freshly prepared, had a total alkaloid content of 8.41% (64% phenolic versus 36% nonphenolic). 87 year old peyote buttons (sent to Watson by Rusby in 1887) had an alkaloid content of 8.86% (65% phenolic and 35% nonphenolic). The mescaline content of the 87 year old buttons was much less than the new ones but they did not have enough variables to account for the difference. 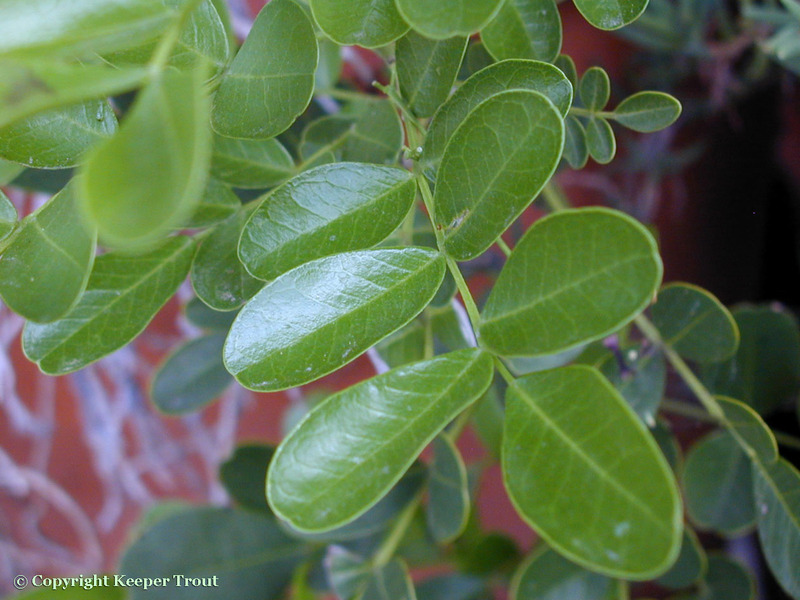 Only minor differences were observed with regards to most of the other alkaloids. Anhalinine was also markedly lower in the old material. Hordenine and 3-Hydroxy-4,5-dimethoxyphenethylamine were almost completely lacking from the old material. The latter of these had been noted earlier by both Späth 1922 and Agurell & Lundström 1968 as being rather unstable. Alkaloid percentages according to Kapadia & Fayez 1973. For more information on isolations and dates see elsewhere here. 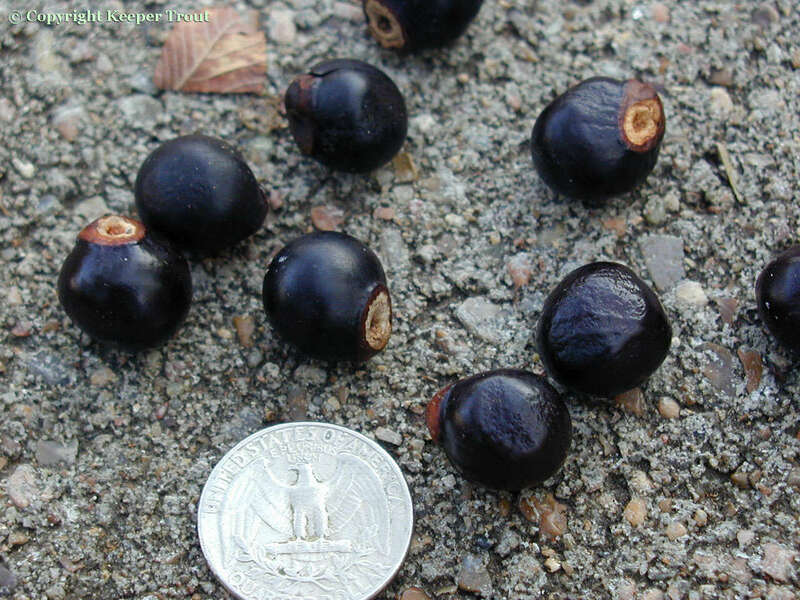 Lundström 1971b found a total alkaloid content of 0.4% w/w to be present in the fresh buttons and noted that 0.41% had been determined by Rouhier (as cited by Anonymous 1959). 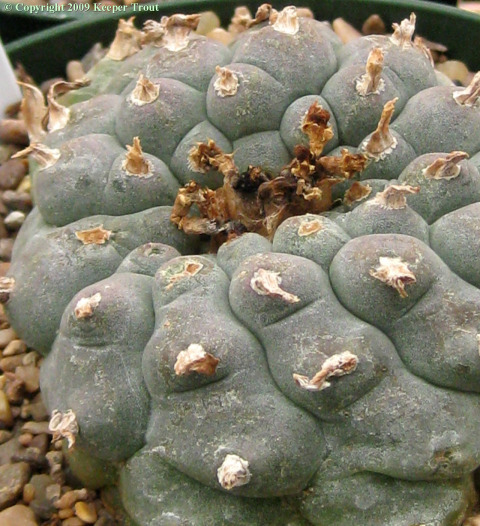 First pharmacological study of peyote was published in Lewin 1888a & 1894a. Heffter (1894)b Berichte der Deutschen Chemischen Gesellschaft, 27: 2975-2979. Heffter (1896)a Berichte der Deutschen Chemischen Gesellschaft, 29: 216-227. Kauder (1899) Archiv der Pharmazie und Berichte der Deutschen Pharmazeutischen Gesellschaft, 237: 190-198. Späth & Beck (1935) Berichte der Deutschen Chemischen Gesellschaft, 68 (3): 501-505. Späth & Beck (1935) Berichte der Deutschen Chemischen Gesellschaft, 68 (5): 944-945. Späth & Bruck (1937) Berichte der Deutschen Chemischen Gesellschaft, 70 (12): 2446-2450. Späth & Bruck (1938) Berichte der Deutschen Chemischen Gesellschaft, 71 (6): 1275-1276. Späth and Bruck (1939) Berichte der Deutschen Chemischen Gesellschaft, 72 (2): 334-338. See Todd 1969 Lloydia, 32 (3): 395-398. Agurell & Lundström 1968 The Chemical Society, London. Chemical Communications, 1638-1639. Kapadia & Fales (1968)a The Chemical Society, London. Chemical Communications, 24: 1688-1689. Kapadia & Fales (1968)b Journal of Pharmaceutical Sciences, 57 (11): 2017-2018, and Kapadia & Fales (1968)a The Chemical Society, London. Chemical Communications,24: 1688-1689. Kapadia et al. (1968) Journal of Pharmaceutical Sciences, 57 (2): 254-262. 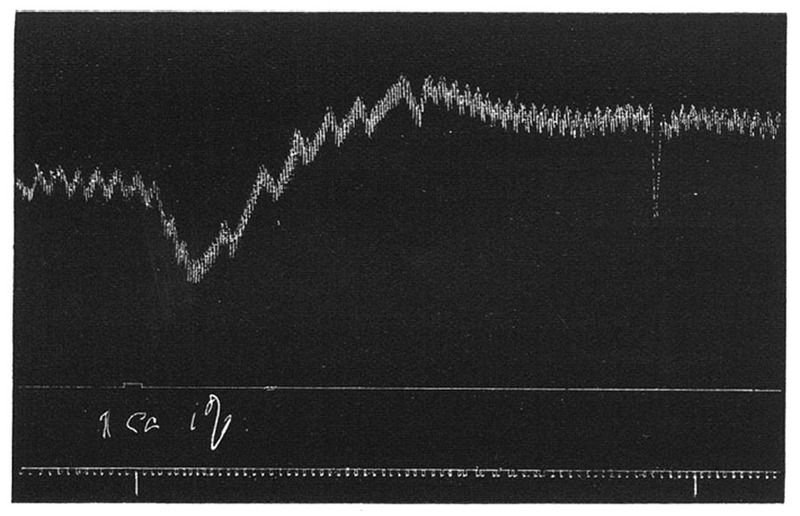 Lundström & Agurell (1968) Journal of Chromatography, 36 (1): 105-108. Kapadia et al. (1969) Paper presented at the 116th Meeting of the American Pharmaceutical Association, Montreal, Canada. May 18-22, and Kapadia et al. (1970)b Journal of the American Chemical Society, 92 (23): 6943-6951. Kapadia et al. (1971) Paper presented at the 118th Meeting of the American Pharmaceutical Association, San Francisco, California, March 27-April 2. 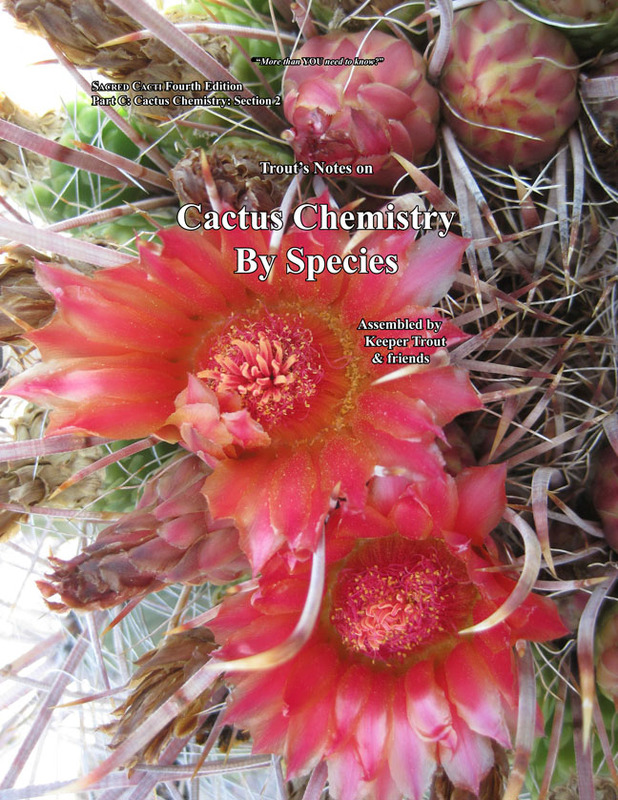 “Some newer synthetic cactus alkaloid analogs.” and Kapadia and Hussain (1972) Journal of Pharmaceutical Sciences, 61 (7): 1172-1173. Lundström (1971) Acta Chemica Scandinavica, 25 (9): 3489-3499. Lundström (1971) Acta Pharmceutica Suecica, 8: 485-496. Lundström (1972) Acta Chemica Scandinavica, 26 (3): 1295-1297. Kapadia et al. (1973) Journal of Heterocyclic Chemistry, 10 (1): 135-136. Cymerman Craig et al. (1977) Journal of the American Chemical Society, 99 (24): 7996-8002. Serotonin was claimed; using ion-interaction HPLC. Its identity was never actually proven and it was not isolated. It presently lacks confirmation. Gennaro et al. (1996) Analytical Letters, 29 (13): 2399-2409. These three compounds were reported but this needs to be taken with caution as their actual isolation and characterization was never performed. All identifications relied entirely on the spectral data of the extracted alkaloids and their corresponding derivated forms. 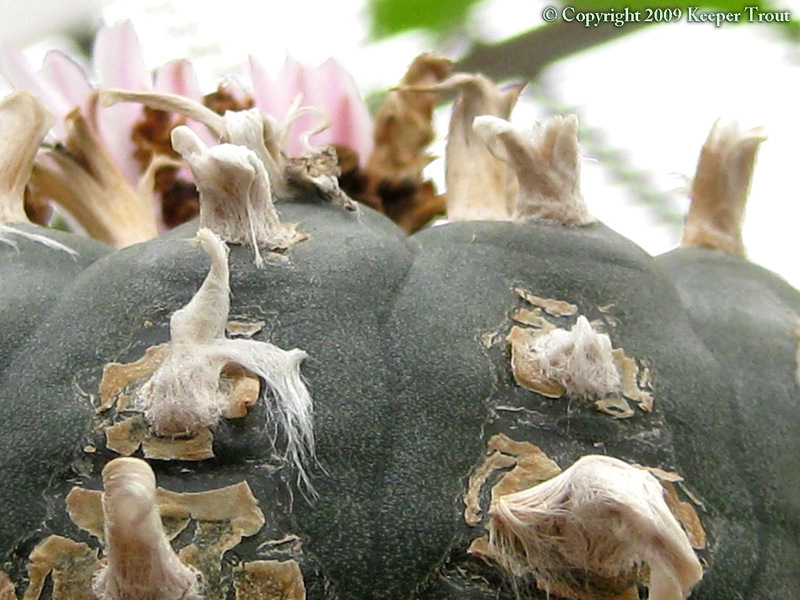 The actual presence of these alkaloids still needs to be independently confirmed. A number of comments from this paper also need questioning, especially concerning their peculiar speculative assertions of their contributions to activity and their baseless allusions to MDMA or designer drug activity. (It was incredibly entitled “Ecstacy analogues found in cacti.” as if the activity of MDMA analogs did not require alpha substitution.) In a personal conversation, shortly after the appearance of this paper, Shulgin described the inclusion of his name as an author to be an “embarassment“. Bruhn et al. (008) Journal of Psychoactive Drugs, 40 (2): 219-222. 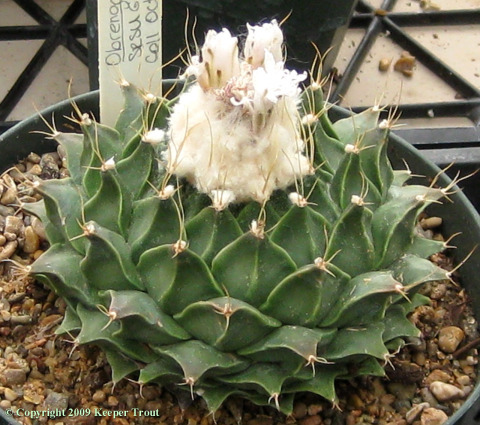 Shulgin had however voiced his anticipation, in PIHKAL, that someday someone WOULD find 3-Methoxy-4,5-methylenedioxy-phenethylamine in a cactus and that it was a surprise that it had not been reported already. 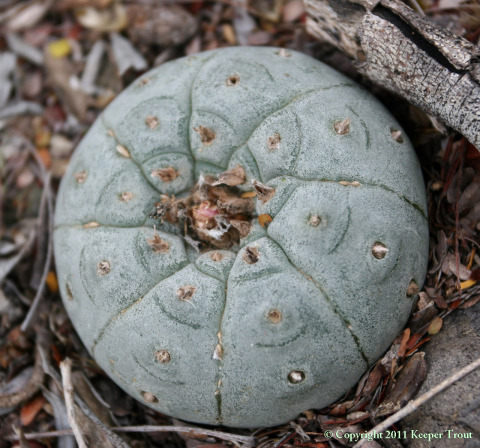 2) Peyote from Parke, Davis and Co. was used by Lewin, and was said by both sources to have originated in Mexico; Mrs. Nickels lived in Laredo. 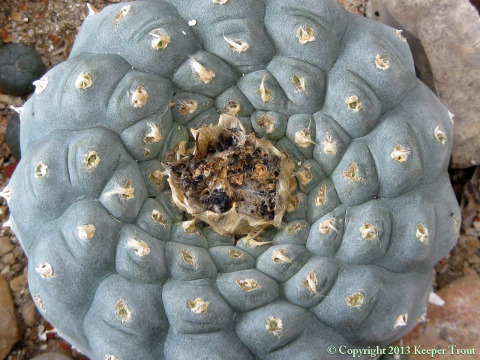 3) Mrs Nickels referred to peyote as mescal buttons. 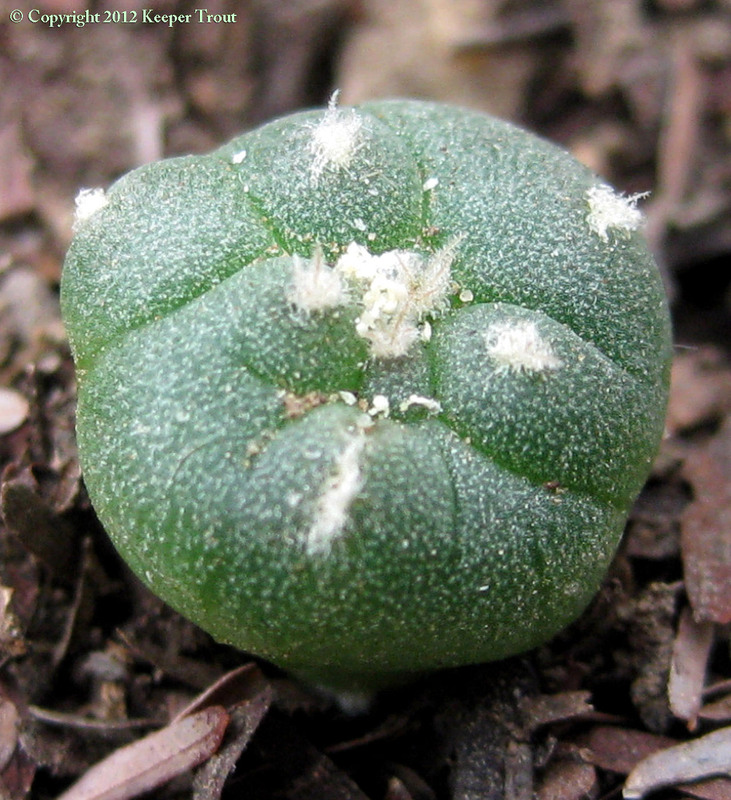 1) Briggs’ brother lived in Mexico and supplied him with peyote. 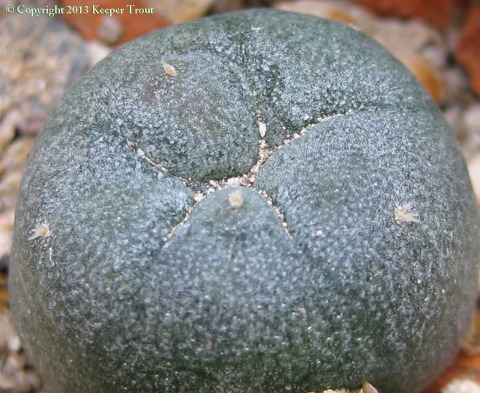 2) Park, Davis’ files on peyote begin with a clipping of a Briggs article. 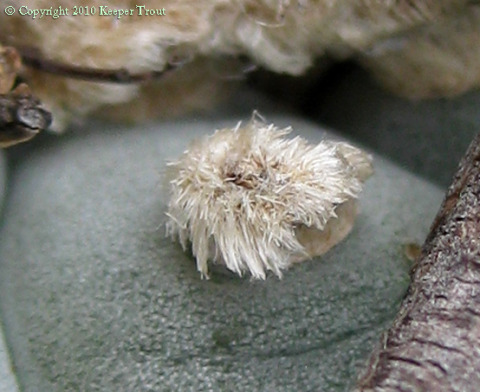 3) Both Lewin and Briggs used the unusual name of muscale buttons. 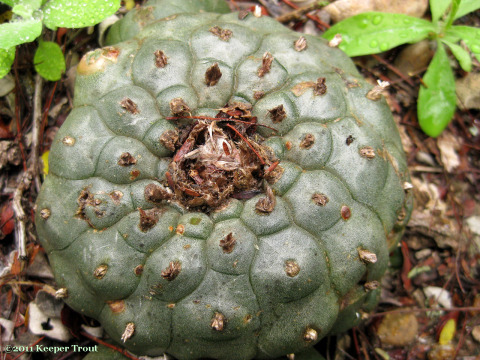 Mrs. Nickels did bring the fact of this plant having medicinal use among native people to the attention of John M. Coulter (around 1892-3). She referred to them as “mescal buttons”. Omer C. Stewart was furnished (By G.A. Bender) with a copy of a letter that Mrs. Nickels had sent to Parke-Davis and Company in Detroit dated 11 July 1888. In this letter, she referred to Anhalonium Williamsii as Piotes. Bender 1969 presents a somewhat different spin on the same account and presents Parke-Davis as becoming aware of mescal buttons due to reading J.R. Briggs’ published account of his ingestion. In Bender’s account, Briggs was contacted by Parke-Davis and requested to procure some mescal buttons on their behalf, which he eventually accomplished. 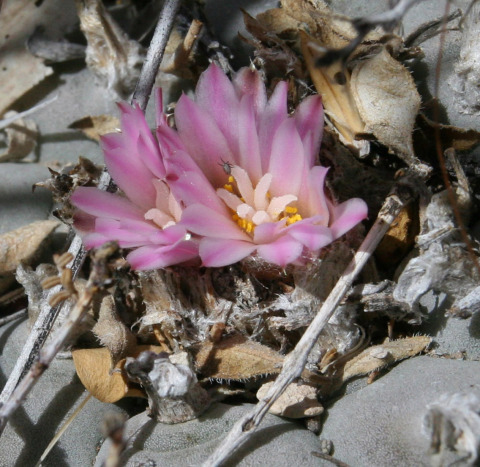 Interestingly, Parke-Davis apparently lacked any understanding of the nature of their source plant so they sought outside help at identification. One of the dried buttons they had mailed to Lewin in Germany is what ended up in Hennings’ hands and became Anhalonium lewinii. 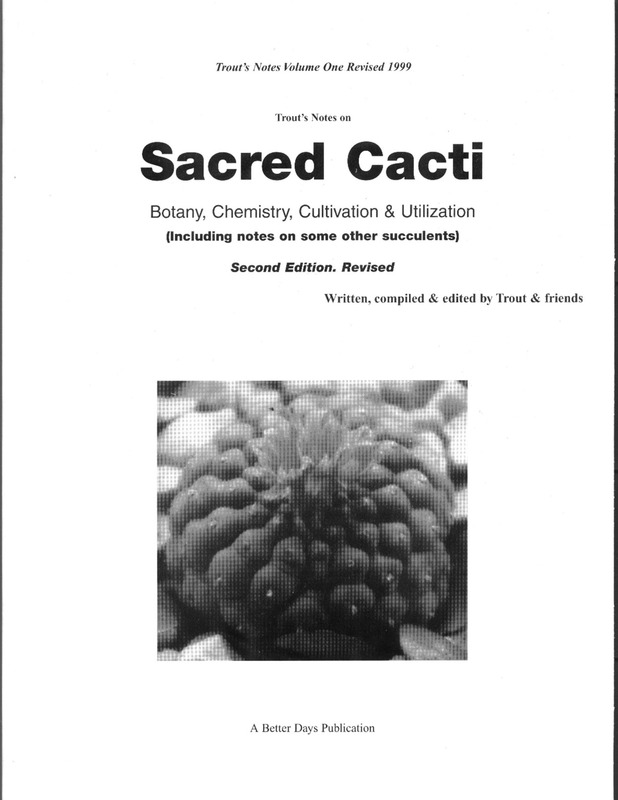 See more details under Mescaline pharmacology (in the book PDF Part C The Cactus Alkaloids) or briefly in the following section. 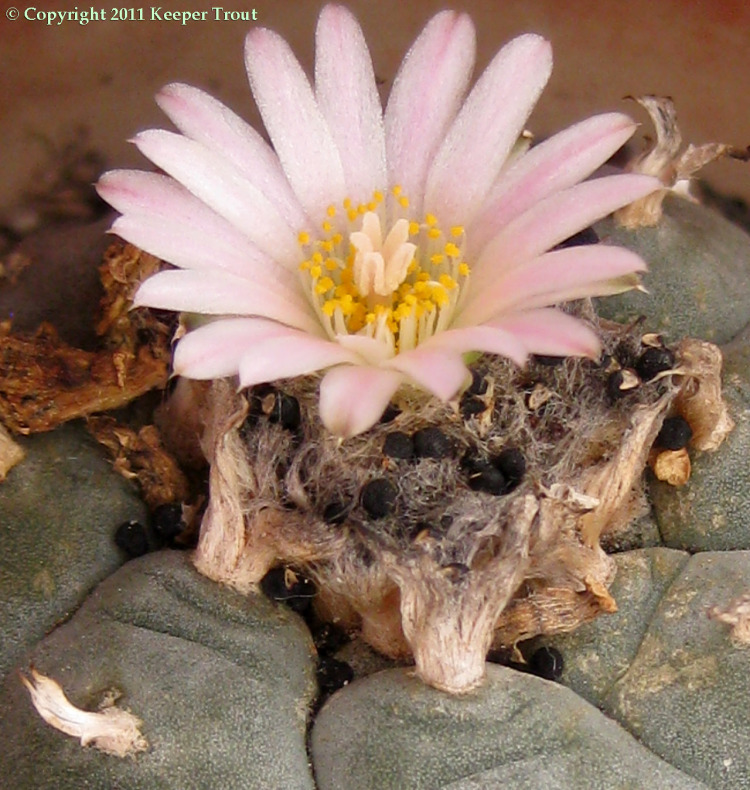 Pharmacology of mescaline and more details concerning the rest of the alkaloids can be found in the book PDF Part C The Cactus Alkaloids. 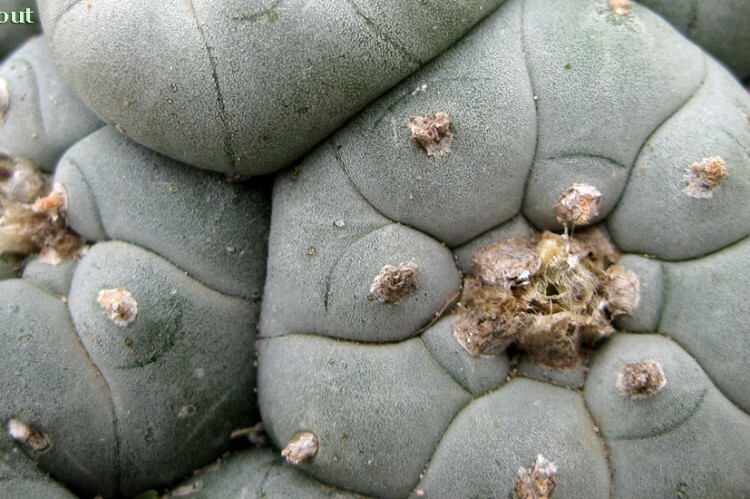 Only a relative few of the peyote alkaloids are mentioned in this section. Those listed have some nature of activity or lack of activity reported in the literature. 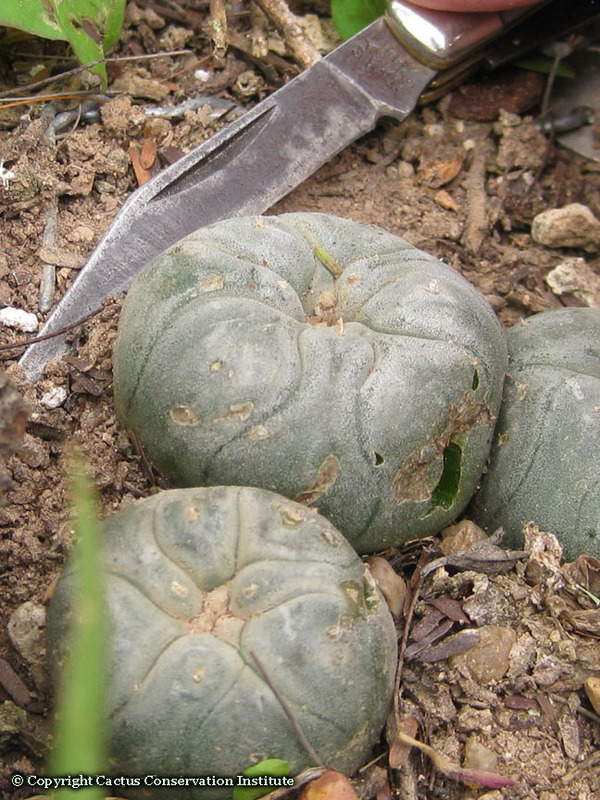 Other alkaloids present in peyote, such as anhalinine are unlikely to contribute substantially, if at all, to its effects. This is due to their inactivity pharmacologically and/or, most often, to their extremely low concentrations. Said to produce slight sleepiness and a dull sensation in the head. LaBarre 1975 citing Rouhier’s Monographie pp. 227-232. 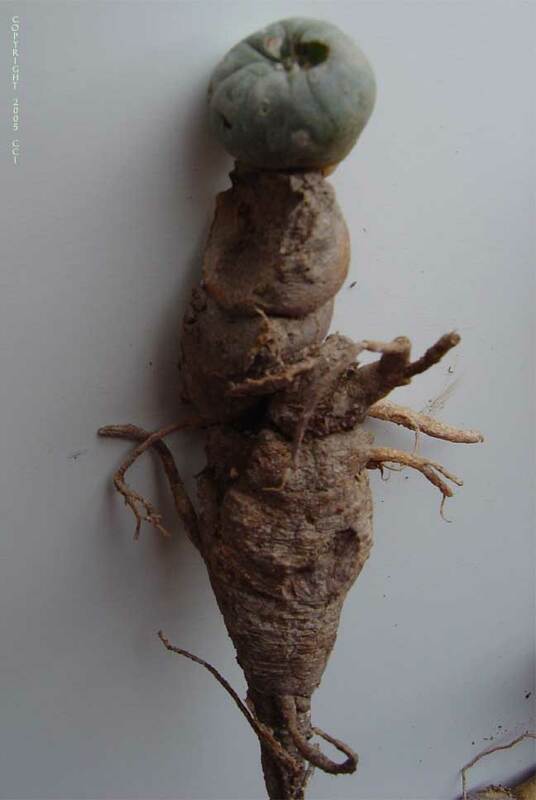 Found to be hardly active as anticonvulsant, tranquilizer or muscle relaxant by Brossi et al. 1966. Active as a stimulant [Bruhn & Bruhn 1973] but a 100 mg. dose was found by Heffter to be inactive. 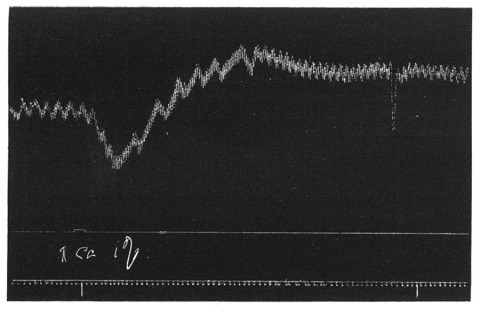 [Ott 1993] Hordenine may potentially contribute some activity as a norepinephrine reuptake inhibitor: Barwell et al. 1989. However, the extent of its actual contribution remains to be studied. 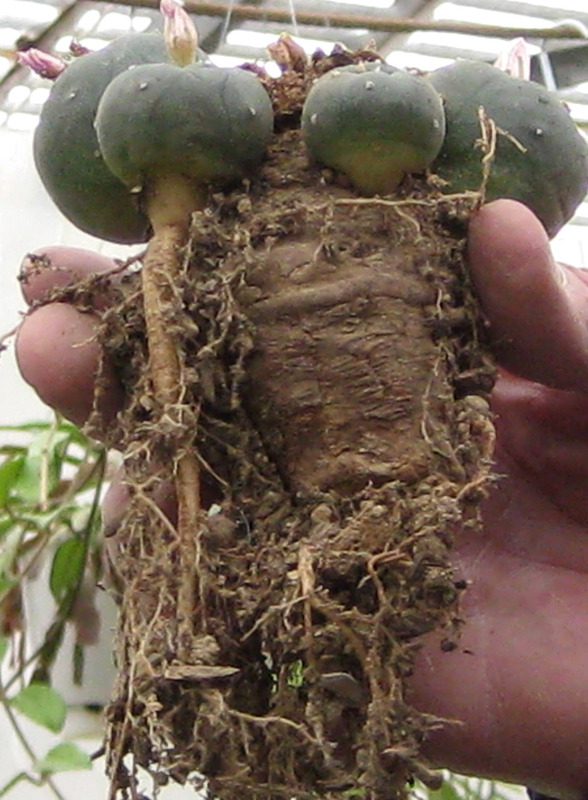 As Todd found this present only in the roots it may be doubtful that it contributes to the pharmacology of peyote although the claim from some users that they get mroe when eating the roots might merit evaluation. 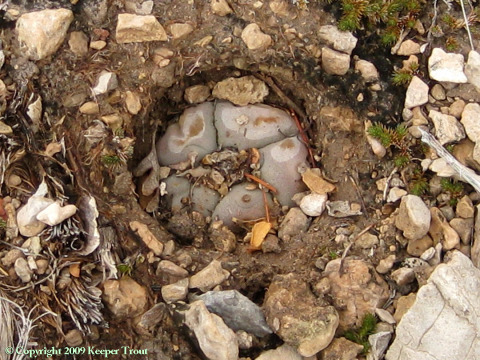 It is presently unknown whether the reported presence of hordenine in peyote buttons by other researchers reflects its occurrence in the tops during normal times of traditional harvest (perhaps before use as a biosynthetic precursor) versus Todd’s analysis occurring during June or whether it is due to the presence of roots or partial roots on the plants these other workers analyzed. (Some other workers did analyze WHOLE plants during their work. See McLaughlin & Paul 1965, 1966 & 1967 and Rao 1970. McLaughlin & Paul 1965 purchased their material from Penick. Found to cause paralysis of the CNS in frogs without previous excitation by Heffter 1894a. Small doses have no effect on blood circulation but larger ones cause hypertension and accelerated pulse. Very large doses cause death by respiratory arrest. Less active than adrenaline, more similar to ephedrine than adrenaline. 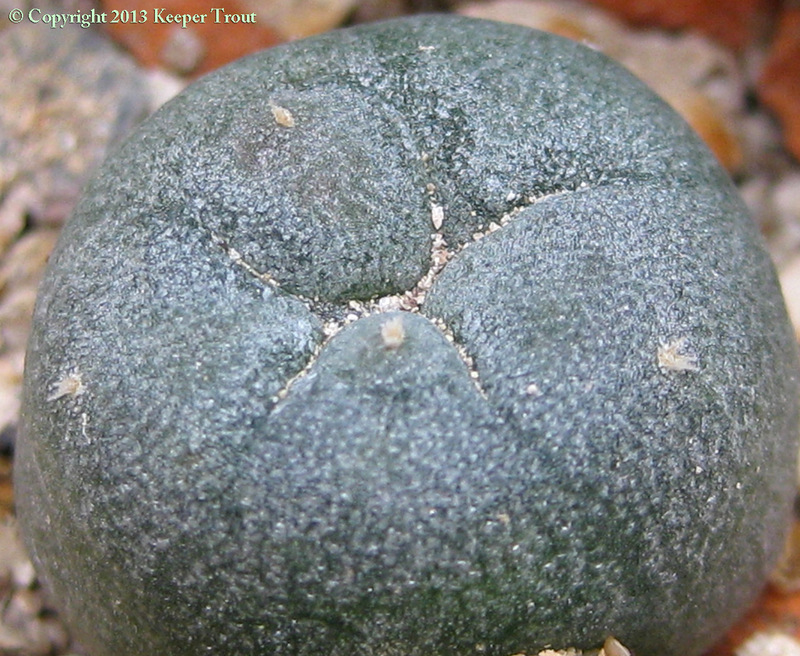 McCleary 1960 who studied the effects of a water soluble crystalline material extracted from peyote, which they named peyocactin, in vitro on 18 penicillin resistant strains including Staphylococcus aureus and Staphylococcus pyogenes. It inhibited all strains. mice inoculated with toxic strains of S. aureus. Found that other cacti were effective on some strains but none were as widely effective as peyote. Rao 1970 showed that peyocactin and hordenine were identical. 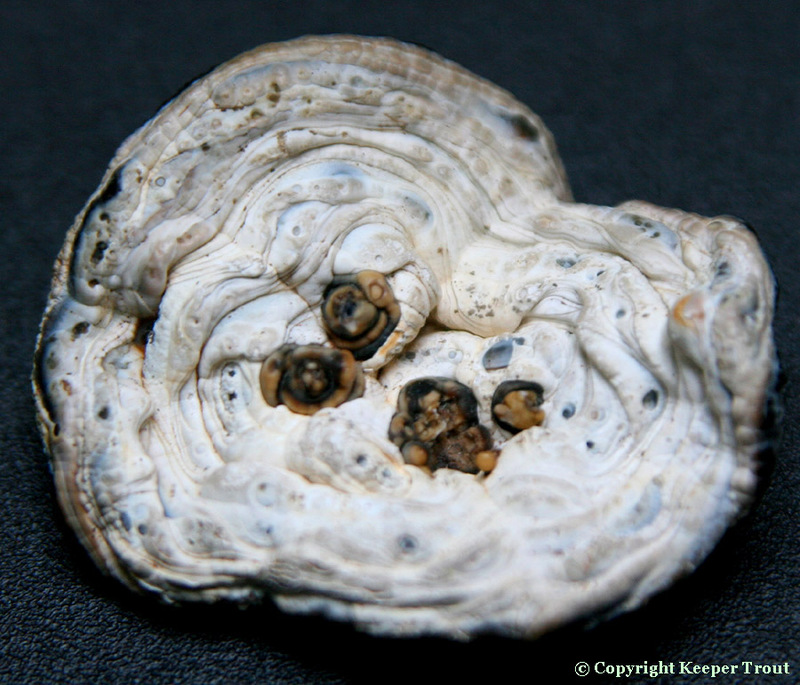 Hordenine has well known antibacterial properties and was generally assumed to be the reason for the bacterial inhibition observed by McCleary above. It should be noted that in spite of peyote’s greater activity in this regard, other cacti they evaluated have been found to have higher hordenine contents. While most people have assumed that the activity is due solely to hordenine, this suggests that the matter is not yet cut and dried and some study might be worthwhile. McLaughlin & Paul 1966 also found in vitro antibiotic activity against a broad range of microorganisms but were unable to document any significant in vivo activity. Shulgin 1973 & 1976 noted that all toxicity data and the assertions of its “highly toxic” nature is based on animal studies and human evaluations limited to Heffter’s single published report. In rabbits hyperexcitability and accelerated respiration were noted at 7 mg/kg. Tetany was induced at 12.5 mg/kg and death at 15-20 mg/kg. More than 70 alkaloids have been published in the literature but some of those are clear errors, others have been questioned or lack confirmation. Only around 63 of those are actually confirmed. 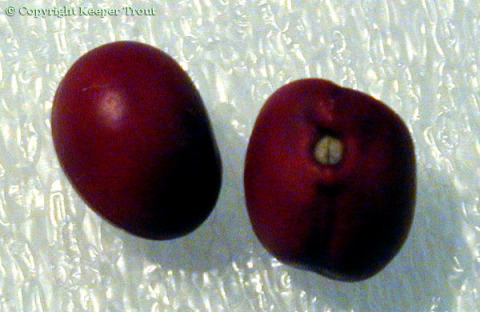 Candicine and O-methylpellotine are disputed, the first as other workers were unable to identify it and the second as it apparently is in L. diffusa but not L. williamsii. One could also question 1,2-Dimethyl-6,7-dimethoxy-8-hydroxy-3,4-dihydroisoquinolinium inner salt as it was was identified entirely by UV and comparison with similar structures. 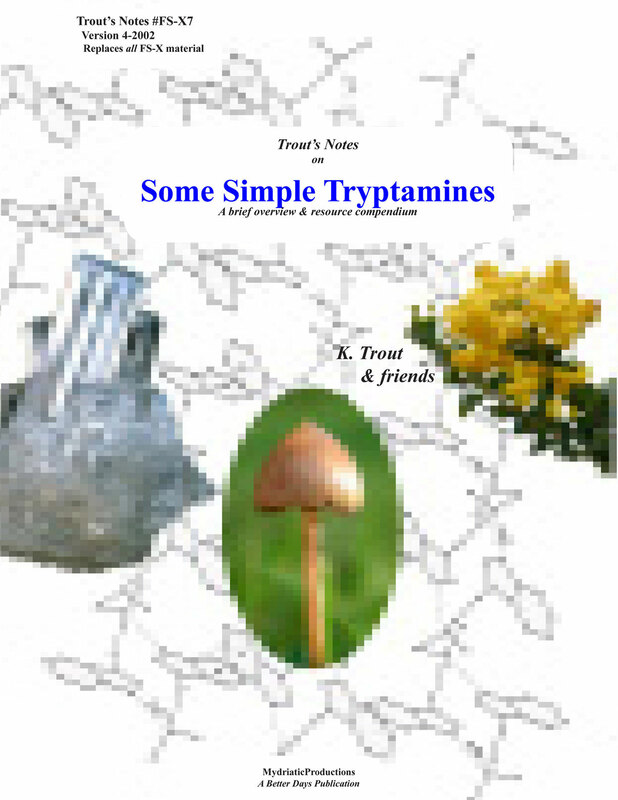 The following list was organized after Anderson but has been updated and expanded to include a summation of the available reports for each alkaloid. McLaughlin & Paul (1966) Lloydia, 29: 315. 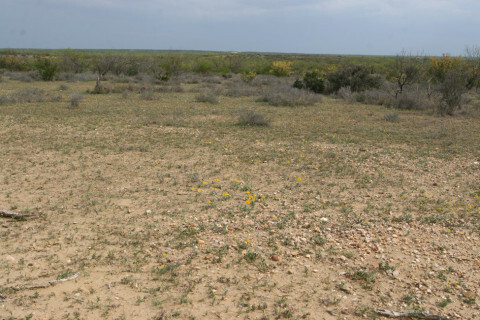 (0.001% dry wt: McLaughlin & Paul 1966; trace: Lundström 1971a. McLaughlin & Paul (1966) Lloydia, 29 (4): 315-327. (0.012% dry wt: McLaughlin & Paul 1966; trace: Lundström 1971a. McLaughlin & Paul (1965) Journal of Pharmaceutical Sciences, 54 (4): 661. (0.6-0.7% dry wt: Lundström 1971b; (0.008% dry wt.) McLaughlin & Paul 1966; Todd 1969 found it only in roots (tlc). Lundström & Agurell (1968) Journal of Chromatography 36 (1): 105-108. Kapadia et al. (1969)a Journal of Pharmaceutical Sciences, 58 (9): 1157-1159. Agurell & Lundström (1968) The Chemical Society, London. Chemical Communications, 24: 1638-1639. Bruhn et al (2008)Lacking isolation & characterization. In need of confirmation. Heffter (1896)a Berichte der Deutschen Chemischen Gesellschaft, 29: 216-227 (original isolation) but the structure was not actually determined until Späth (1919) Monatshefte fuer Chemie, 40: 129-154. [As L. williamsii var. typica Croizat: 0.709% (± 0.032) dry wt. Lundström (1972) Acta Chemica Scandinavica, 26: 1295-1297. Späth & Beck (1935)b Berichte der Deutschen Chemischen Gesellschaft, 68 (5): 944-945. Kauder, E. (1899) Archiv der Pharmazie und Berichte der Deutschen Pharmazeutischen Gesellschaft, 237: 190-198. Cymerman Craig, J. et al. (1977) Journal of the American Chemical Society 99 (24): 7996-8002. 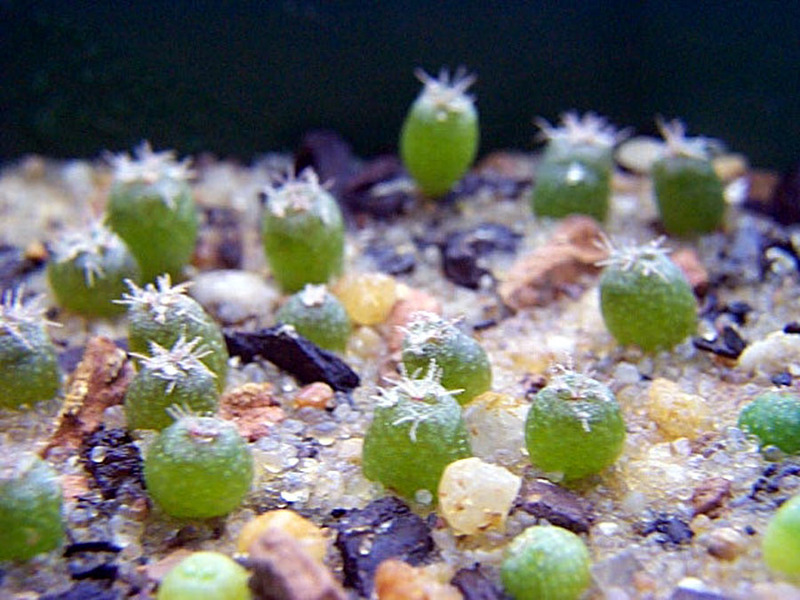 As L. williamsii var. 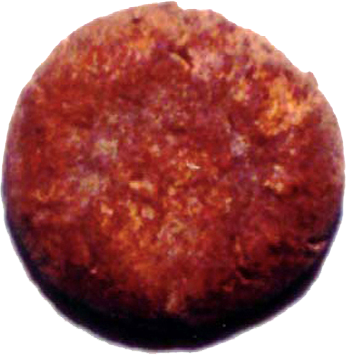 typica: 0.296% (± 0.065) Habermann 1978a: from Štarha in Grym 1997. Späth & Bruck (1939) Berichte der Deutschen Chemischen Gesellschaft, 72 (2): 334-338. 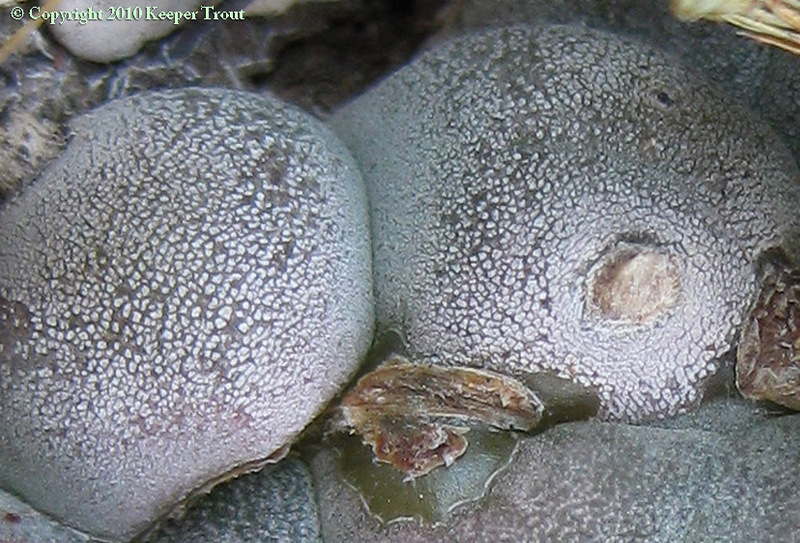 Presence in L. williamsii is in doubt. It is included by Mata & McLaughlin 1982 but they do not list individual references for the compounds. Bruhn & Agurell believed that it is unique to L. diffusa but it was later it was found in Pachycereus weberi. Fujita et al. (1972) Yakugaku Zasshi, 92 (4): 482-489. Fujita et al. (1972) , 92 (4): 482-489. (0.0001% fresh weight: Fujita et al. 1972: as L. williamsii var. 0.5% dry wt: Heffter 1898c. Kapadia & Fales (1968)b Journal of Pharmaceutical Sciences,. 57 (11): 2017-2018. Kapadia & Fayez (1970) cited “Kapadia, Rao, Leete, Fayez, Vaishnav and Fales, to be published.” i.e. Kapadia et al. 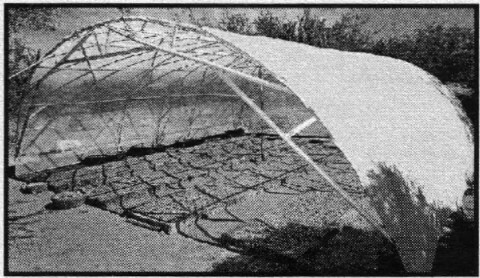 (1970)b Journal of the American Chemical Society 92 (23): 6943-6951. Kapadia et al. (1970)b Journal of the American Chemical Society, 92 (23): 6943-6951. Kapadia & Hussain (1972) Journal of Pharmaceutical Sciences, 61 (7): 1172-1173. Kapadia et al. (1970)a Lloydia, 33 (4): 492. Kapadia & Fayez (1970) cite Kapadia et al. “11th Ann. Meet. Amer. Soc. 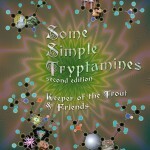 Pharmacognosy (Vienna, Austria) July 1970, To be published.” i.e. Kapadia et al. (1970)a Lloydia, 33 (4): 492. Kapadia & Highet (1968) Journal of Pharmaceutical Sciences, 57: 191-192. Strongly alkaline viscous liquid. 123 mg from 2.3 kg dried peyote. Kapadia et al. (1968) Journal of Pharmaceutical Sciences,. 57 (2): 254-262. 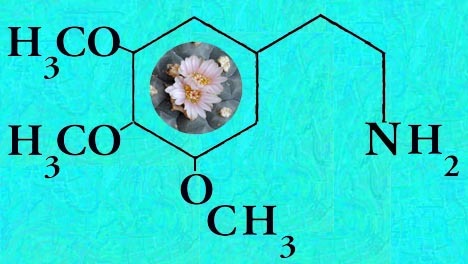 Serotonin was claimed in hplc by Gennaro et al. 1996. This identity was never conclusively proven and it has not been confirmed. Glucaric acid (saccharic acid) (tlc by Kringstad & Nordal 1975). 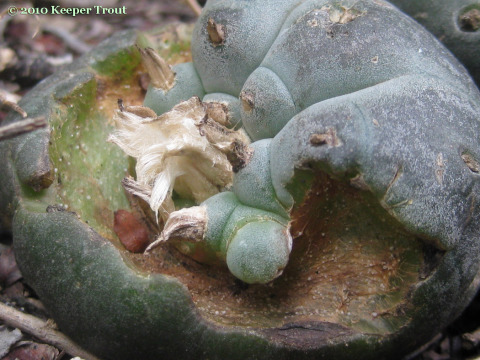 Users of fresh peyote have observed it as well due to it being readily perceived as sand or grit present inside of the flesh. Oxalate is sometimes present in appreciable quantities. 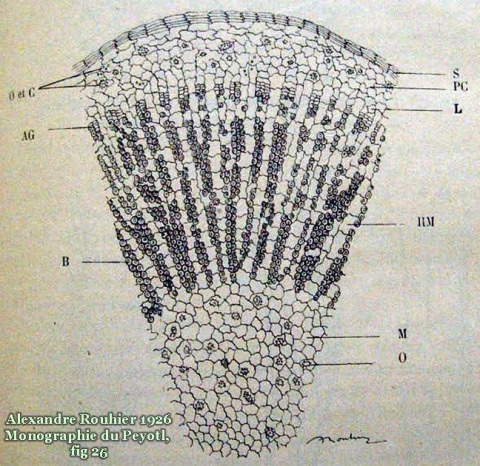 Rouhier 1926 observed the presence of oxalate crystals in his histological study of the plant. 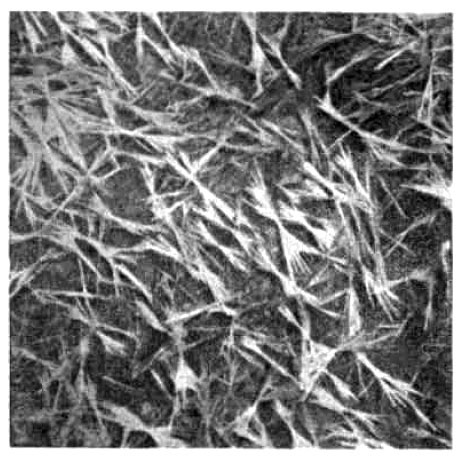 These are labelled “O” in the drawing below; “C” is said to indicate the shards created by the action of the microtome when making the thin section slice. Oxalate appears to be present in the form of druses (whewellite? 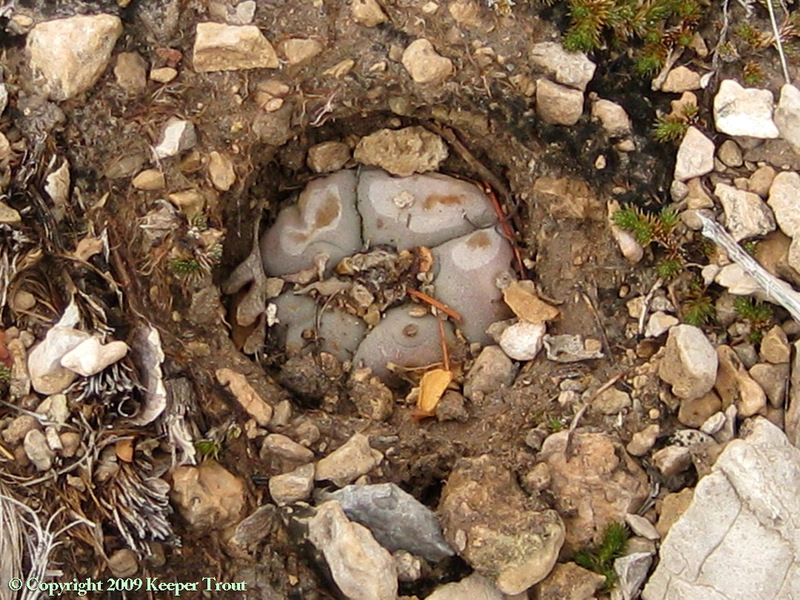 ), crystal sand and as additional forms. Rouhier commented on “oursins d’oxalate de chaux [weddellite?] et vaisseaux spiralés” being present in the flesh in addition to “macies d’oxalate de calcium“. Jan Lundström (1983) “Simple Isoquinoline Alkaloids.” pp. 255-327 (Chapter 6) in: Arnold Brossi (Ed.) The Alkaloids. Chemistry and Pharmacology. Volume 21. 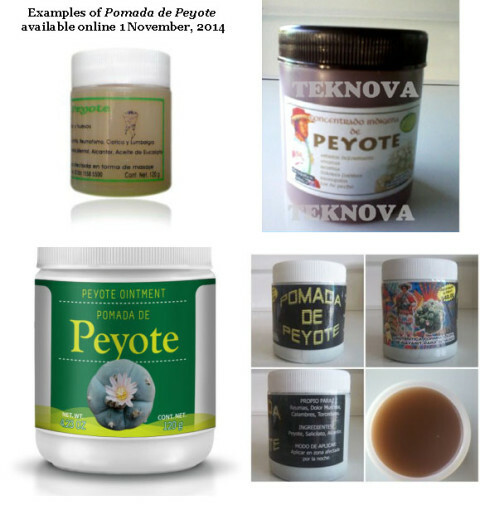 Archaic peyote, the red bean & more. 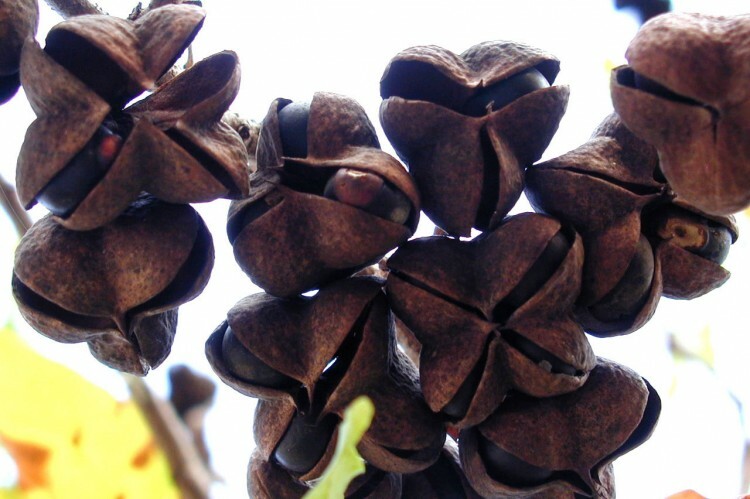 First, any evidence presented for the sacramental use of the Mexican Buckeye (Ungnadia speciosa Endl.) 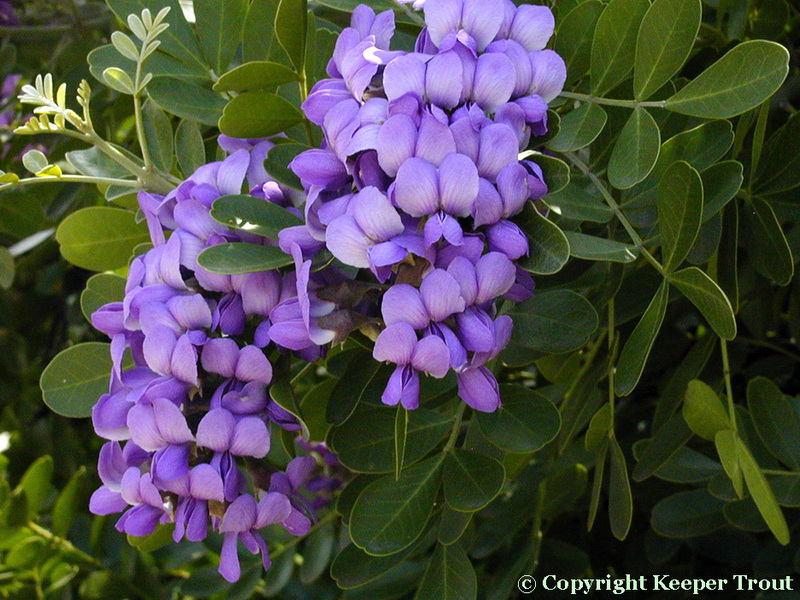 is circumstantial at best, being primarily based on its form of packaging being similar to that of the Texas mountain-laurel (Sophora secundiflora (Ort.) Lag. 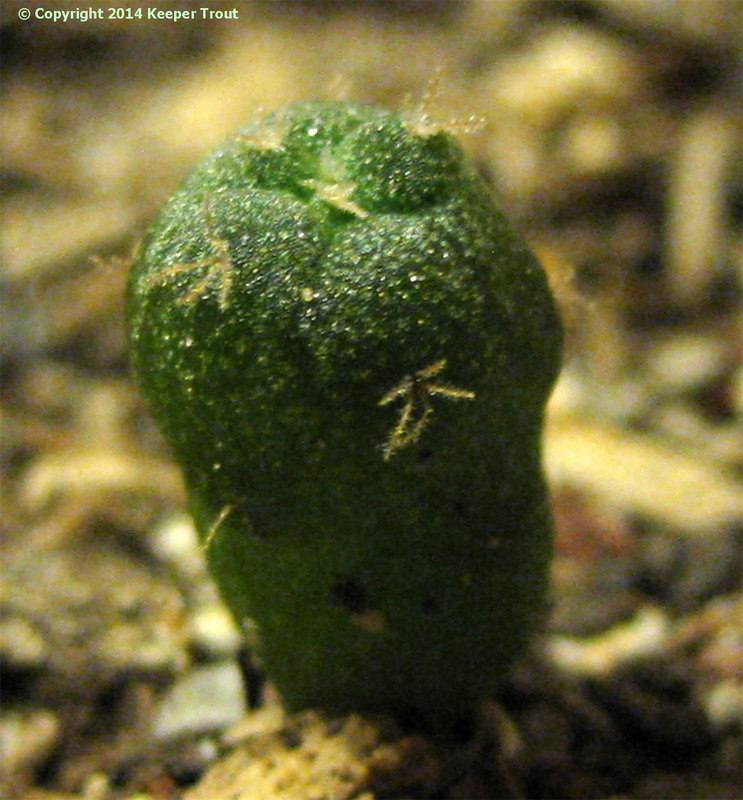 ex SD), their occasional comingling, and was bolstered with only one second-hand reference to it being a euphoric plant. There does not appear to be any accounts of or archaeological evidence for it actually being used for human ingestion ceremonially. This is not a small point to overlook. Finally, my main objection to the conclusions of Adavasio & Fry concerning peyote is that they only selectively mention one solitary occurrence of the plant found by an earlier worker [Note 30]. 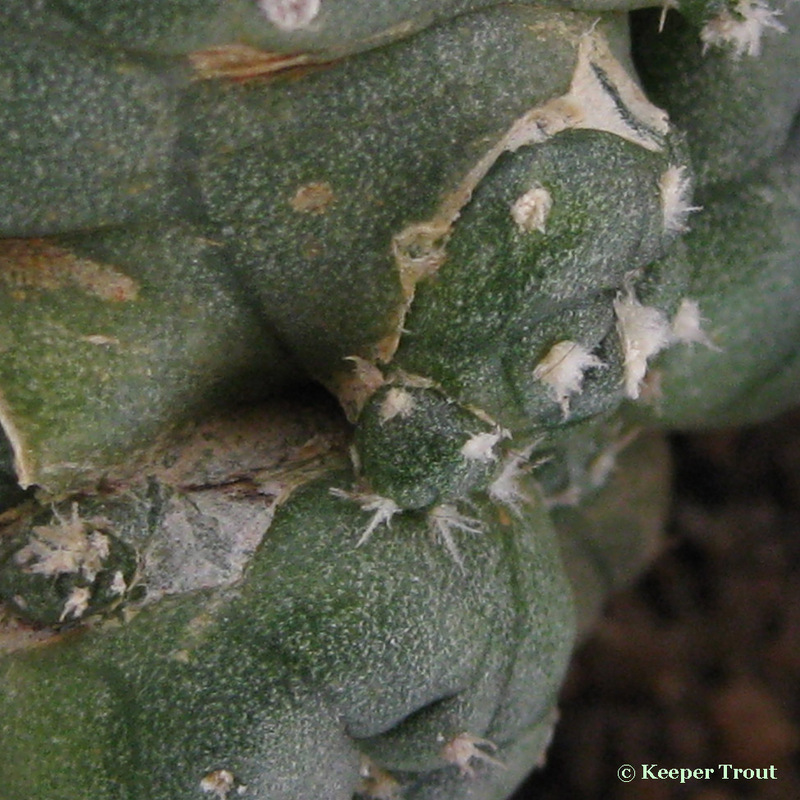 Campbell 1958 had flatly asserted that it was not possible to demonstrate the priority of mescal beans over peyote based on the available evidence so something more is required. It might also be added that there is a lack of evidence suggesting a continuity of culture in which a sequential series of sacramental replacements *could* occur but this seems trivial by comparison to items 1, 2 or 3. The omission by Adovasio & Fry of any reference to additional finds is puzzling but it is far from being the only instance of cherry-picking that one can encounter in this area. 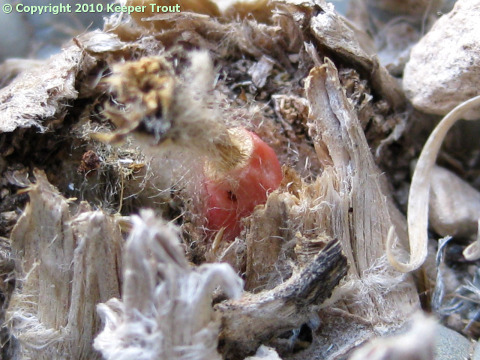 The account of Bruhn et al. 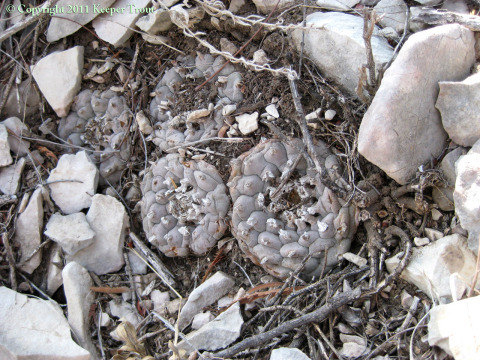 1978 gave its age based not on the actual dating of the peyote but on the dating of material thought to be associated with that single set of 8 strung and remarkably well preserved peyote buttons. Three mats had been dated with a range of 810-1070 AD (uncorrected values). 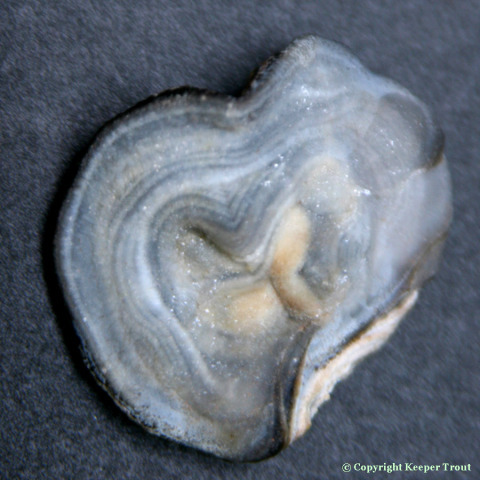 Peter Furst was the first to report a date of 7000 BP for the Shumla cave material but due to several reasons the actual test data is either lost or irretrievable. It is therefore not possible to know anything further about the work or the claim. That claim oddly only appeared as a passing mention within a book review written by Furst. His date was repeated by Schultes & Hofmann and now appears stated as a fact throughout the literature. Bruhn then made the peculiar proposal that the reason they could only detect mescaline could be due to mescaline being more stable than the other peyote alkaloids. Reasonable enough on the surface yet it is noteworthy that in this Bruhn failed to mention any of his own previous work that contradicts this claim. Clearly something is in need of closer inspection. This claim about the Shumla specimens needs consideration in the light of his 1978 Cuatro Cienegas results. There was also his earlier report concerning degradation of peyote alkaloids in the study of 87 year old peyote buttons in Bruhn & Holmstedt 1974. In particular, their determination clearly showing that mescaline content apparently decreased *ahead* of the rate of decomposition of many of the other alkaloids. The cherry-picked selective presentation of facts in their 2002/2003/2005 account appear to have been overlooked by Bruhn’s peer reviewers or at least they dropped the ball in terms of what peer review is meant to accomplish. That is all actually fairly however when trivial compared to what they AND Bruhn’s crew missed. Or are Bruhn/El-Seedi/DeSmet’s reported analytical results simply needing to be questioned? 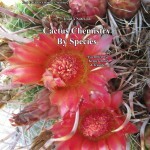 They are amazing natural treasures but clearly are not of botanical origin.